Unfortunately, we had some very sad news on the 7th April, as we found out that one of our friends had passed away. Today was his funeral, so as a mark of respect I thought it would be nice to dedicate this blog post to him. Dan was the most intelligent man I have ever, ever met. He knew everything about everything and could reel off names, dates, times etc. in almost every topic you could think of. He was wonderful to have on our team when we entered the quiz nights at the Primary School that our daughters all went to. 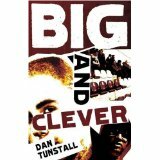 Dan was a talented writer and in 2009 Dan had his first book published ‘Big And Clever’ which was actually shortlisted for the Bradford Boase Award for first young adult novels. It only seems like yesterday that we were invited to his first book launch. 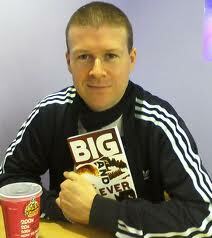 His second book was published in 2011, called ‘Out Of Towners’. I remember him and his wife Carey, spending such a long time making sure the cover photo for his book was just right. They eventually picked the ‘Eastbourne Pier’, as Eastbourne was one of the places he loved the most. 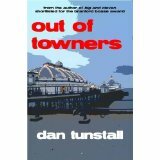 In fact I remember we all spent a lovely day at Eastbourne with Dan and his family a couple of years ago. Dan used to go into schools to talk about his books and was popular with teenage boys, who identified with the characters that he wrote about. 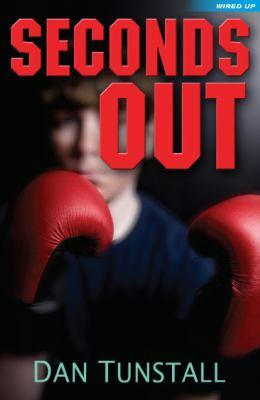 He also wrote a book called ‘Seconds Out’ and then unsurprisingly contributed to a four-author anthology with Alan Gibbons. Dan had the world at his fingers tips, but he just couldn’t see it and unfortunately his friends and family know the outcome of this. You will sadly be missed Dan. 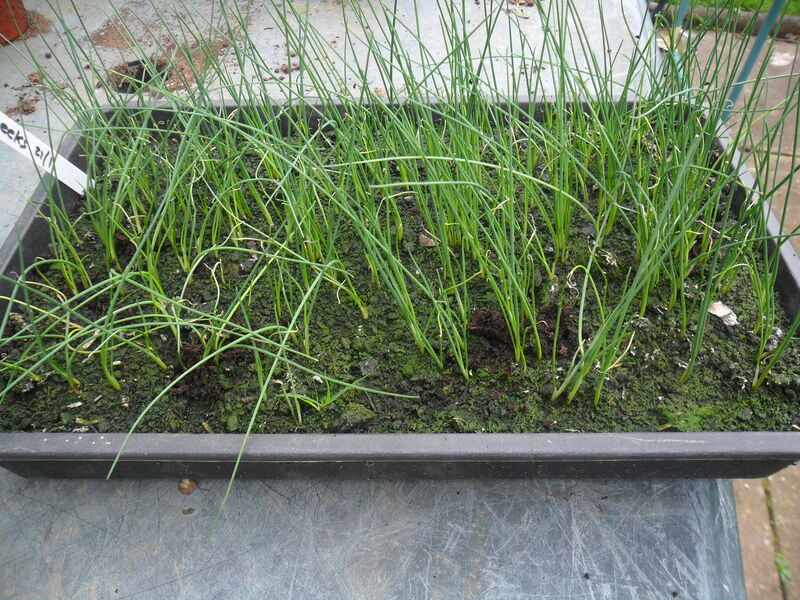 My leeks are one of the first crops I sow in the new year and this year I sowed them on the 21st February. 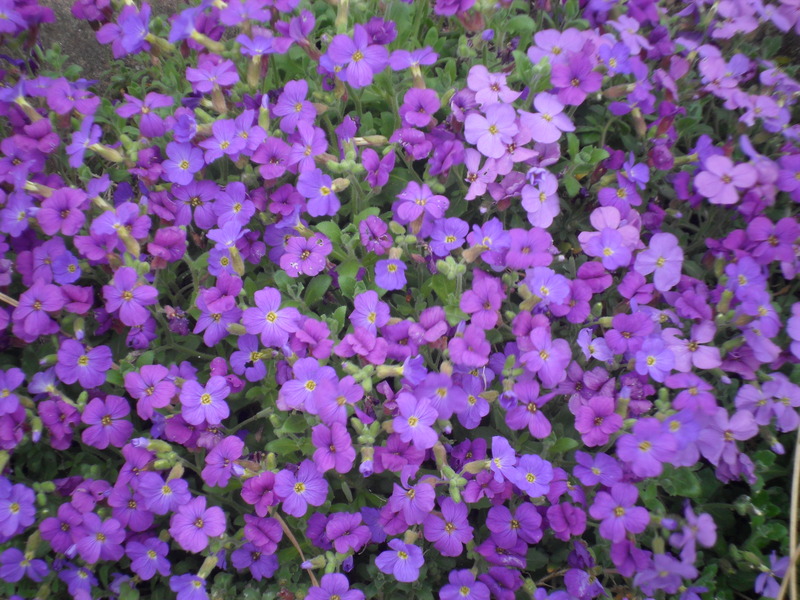 They are a variety called ‘Musselburgh’. 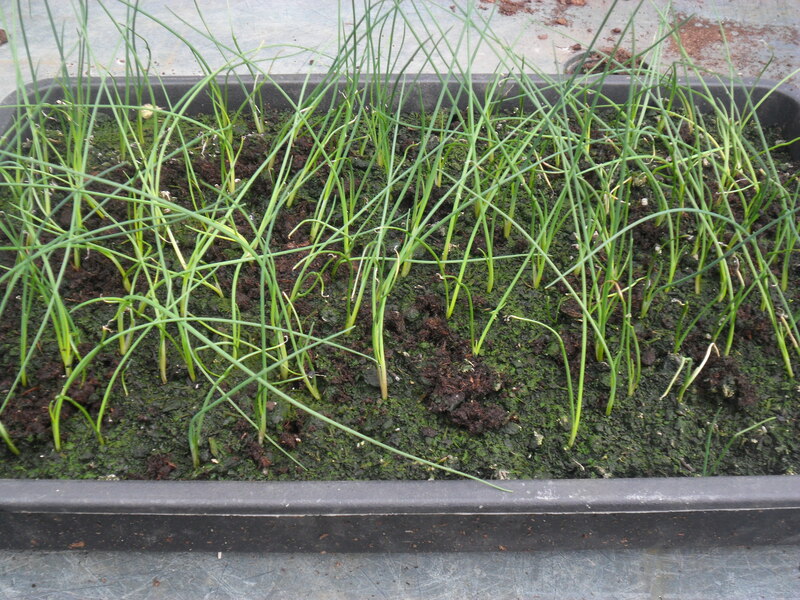 Leeks are an easy crop to grow from seed. 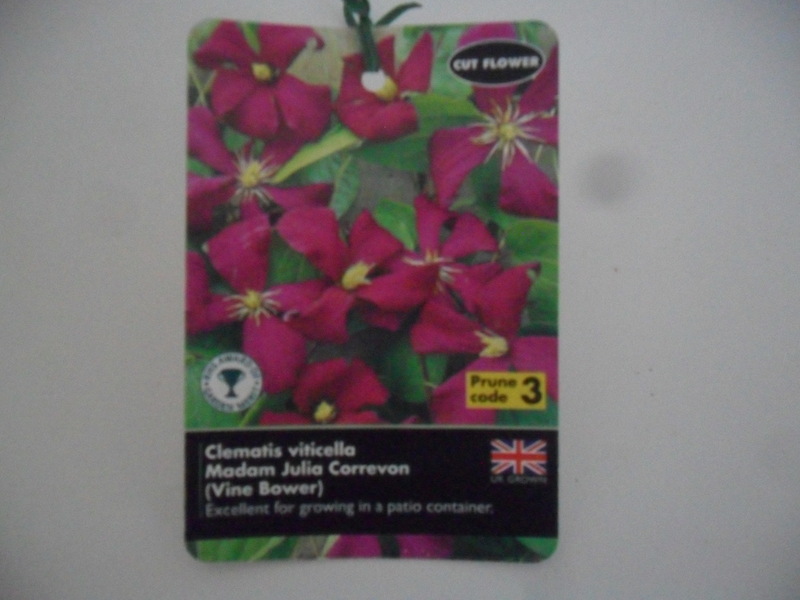 I sow them in a seed tray and leave them inside my house until the moment they germinate and then I move them to my cold greenhouse to grow on. No matter how I try, I always sow my leek seeds too thickly and at this time of year I end up having to carefully ‘thin’ them out. 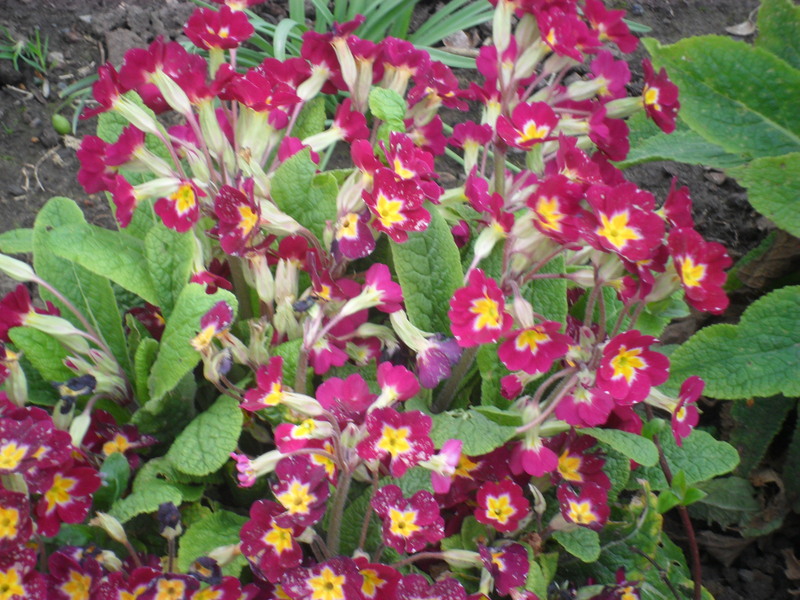 ‘Thinning out’ is just a name for removing some of the plants, so that the remaining ones can grow to a decent size before you plant them out. 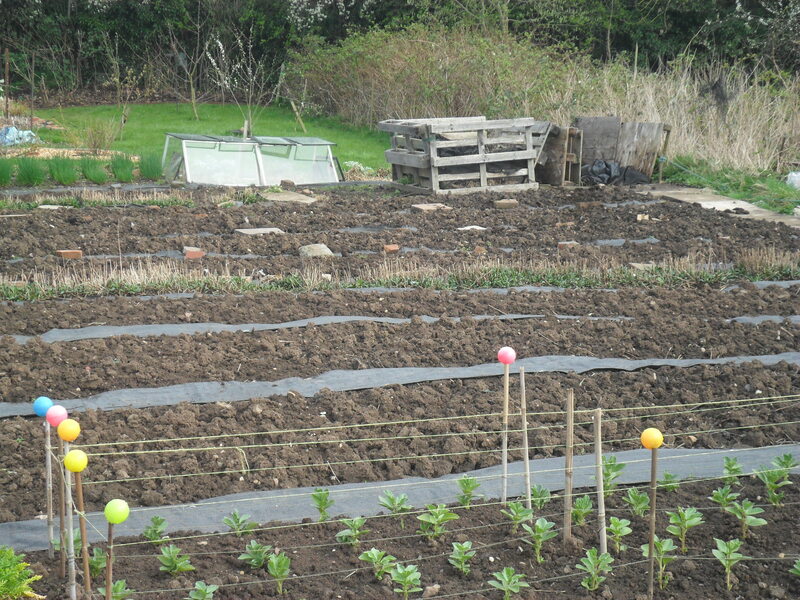 A lot of my time this week has been spent seed sowing. 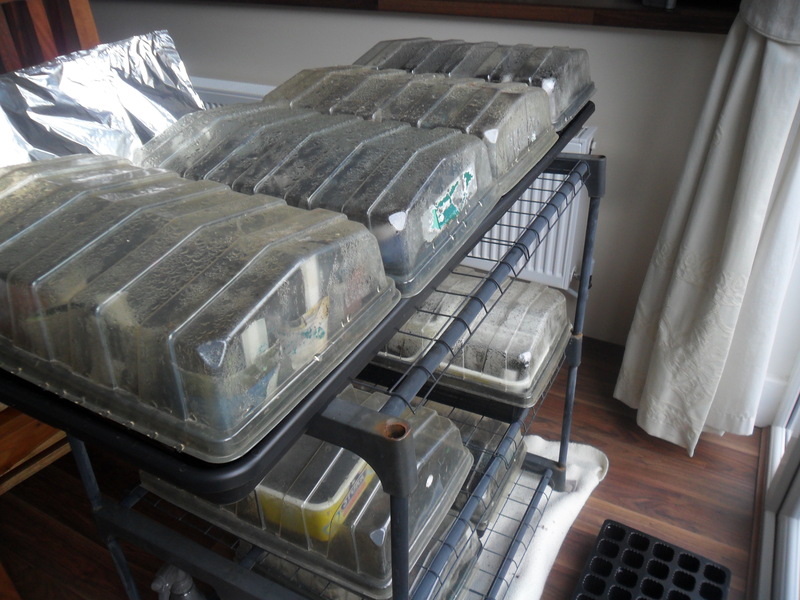 I start most of my vegetable seeds off at home as I find I get a much better gemination rate as I can give them the exact conditions that the seeds like. 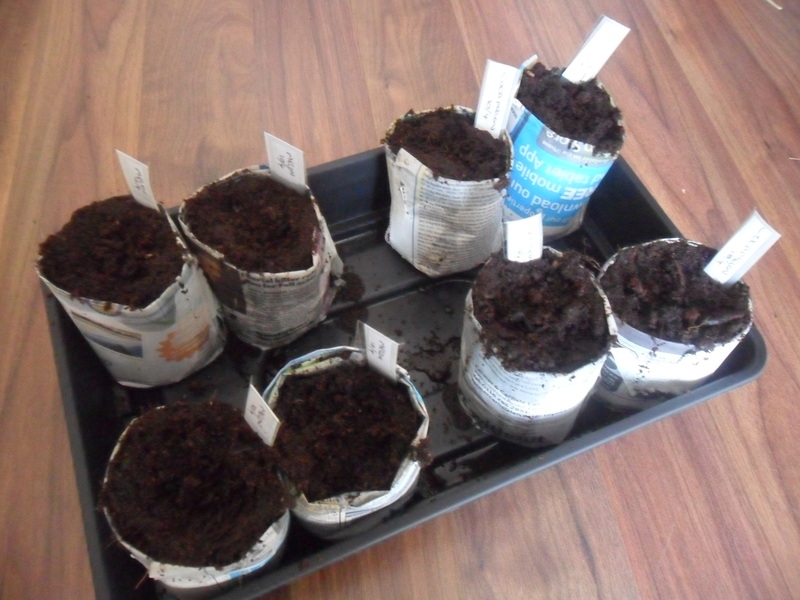 So this week I have sown my outdoor tomatoes, parsnips, beetroot, spring onions, spring broccoli, khol rabi, basil, coriander, swede, lettuce, turnips and perpetual spinach. 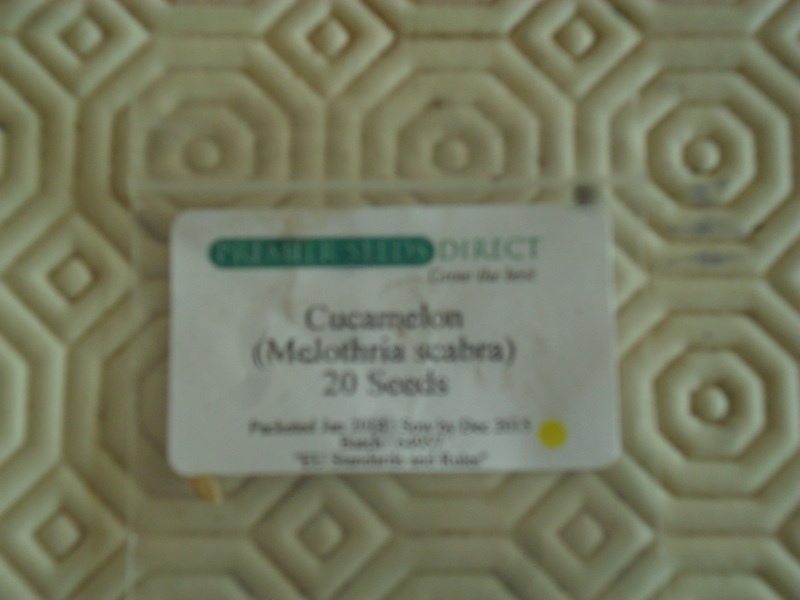 I like to try out something new each year and this year I have decided to give the ‘cucamelon’ a go. I have read various good and bad reviews about these, so I decided to bite the bullet and have a go myself. Apparently, they look like grape sized watermelons that taste like cucumbers with a hint of lime and they are supposed to be really easy to grow….I will let you know. You can read about cucamelons here. 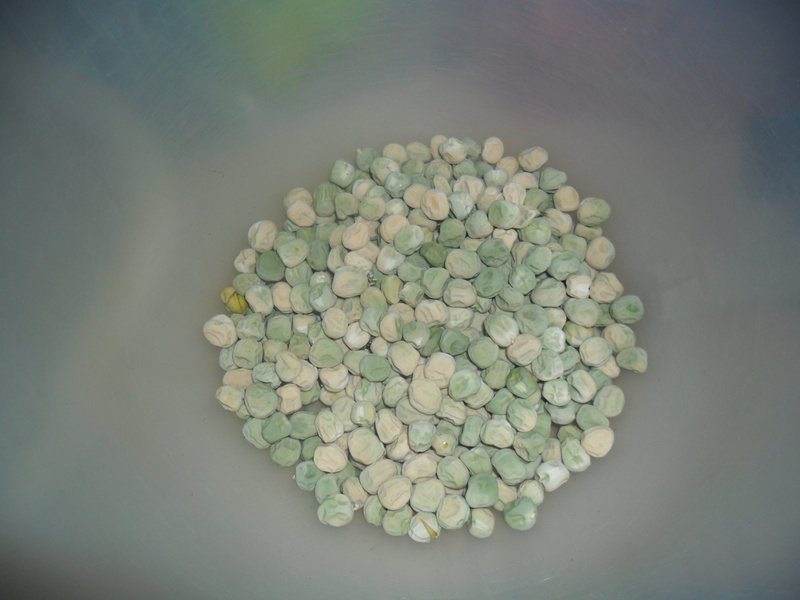 I also sowed my climbing peas this week, they are a variety called ‘peashooter’. I absolutely love this variety as the peas are so fat and juicy and I have never had a bad crop. I saved the seeds from last years crop, as the seeds are expensive to buy and easy to save. 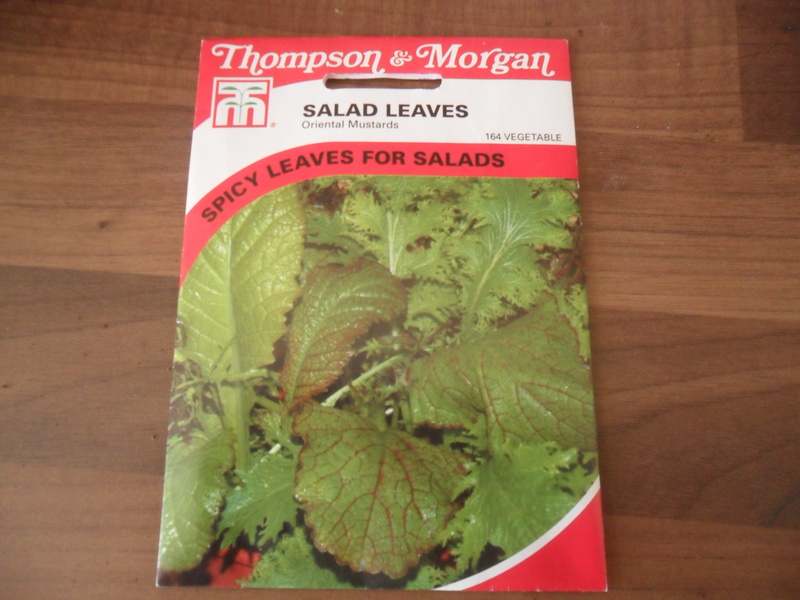 I also like to have some salad leaves handy at home, ready to use, so I started off some mixed salad leaves this week too. 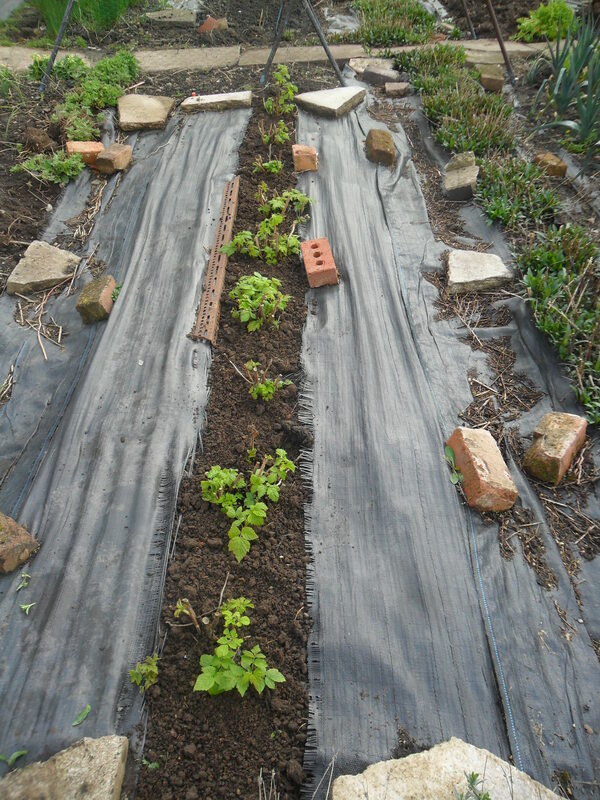 I used an old grocers box with an old compost bag to line it. 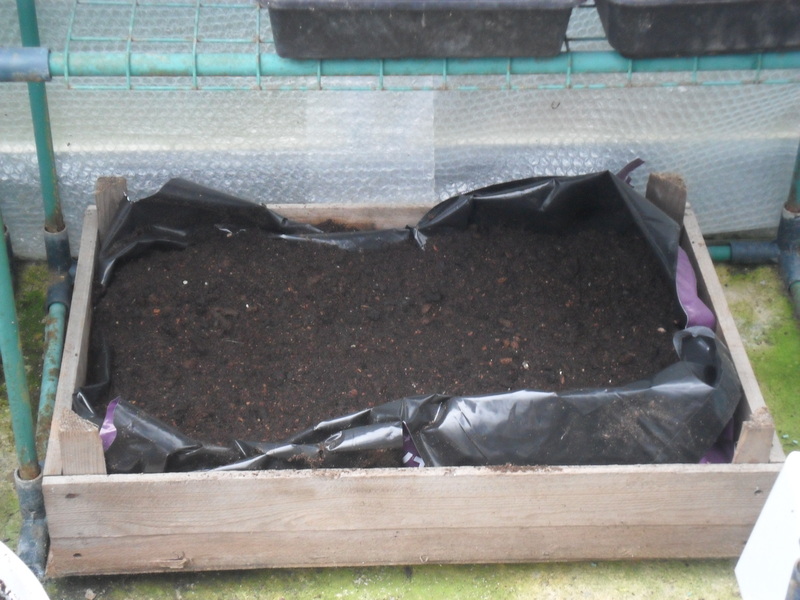 I fill it with compost, sow the seeds and then cover the seeds with a little more compost. I then just place the box and in my greenhouse and give it a good water. 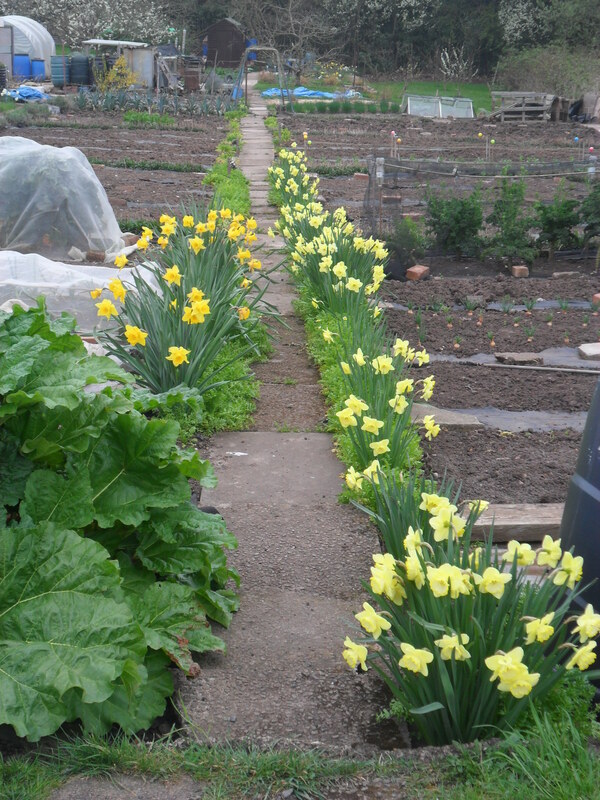 I use them as a ‘cut and come again’ crop, as once you cut them they grow again. The green house is filling up nicely now. 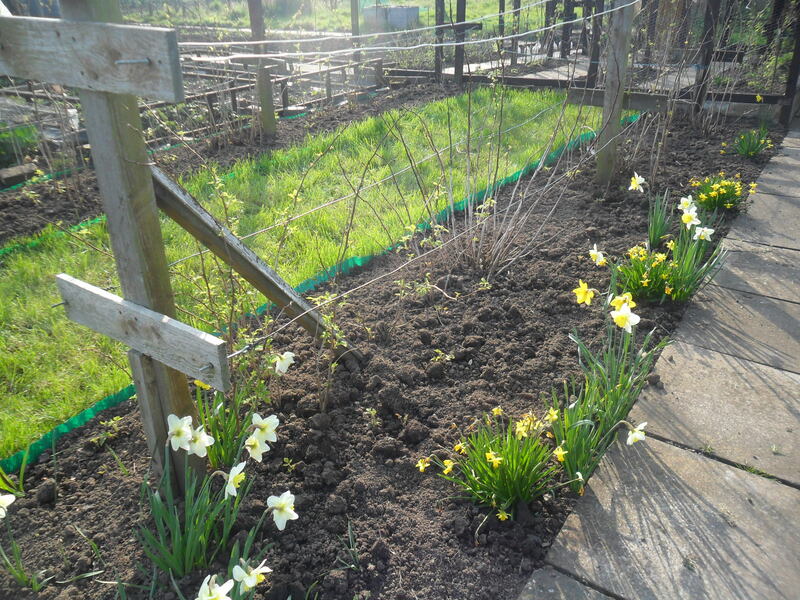 At my allotment this week I finally painted the wood around the new area that surrounds my blackberries. I also began a project to smarten up the area in front of my utility area. I put some wood down to surround my bed and finished it off with a lick of wood stain too. I also planted a clematis that my daughters bought me for Mother’s Day. I planted the clematis to climb up the old swing that I brought to the allotment a couple of weeks ago. 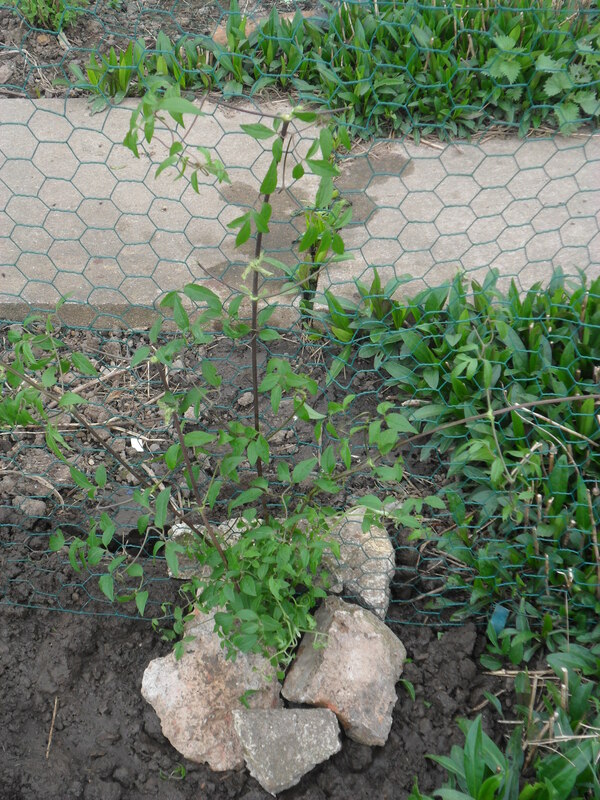 I made sure the clematis was planted deeply and I covered the roots with stones to guard against ‘clematis wilt’. The clematis I planted over the other swing last year, was an early flowering clematis called ‘montana’. The new clematis will flower during summer, so hopefully it will look beautiful climbing over the swing. 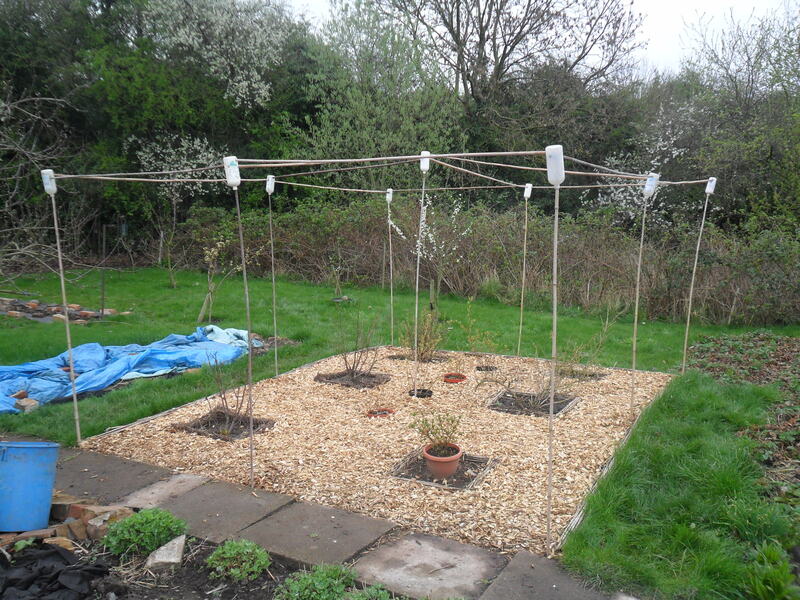 This week I also put up my D-I-Y, no nails or screws, fruit cage. 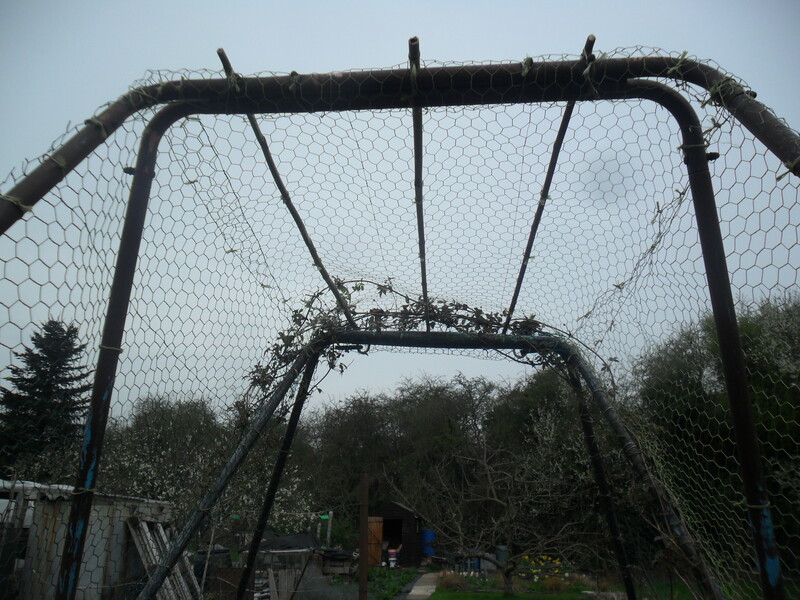 I can’t afford one of those lovely fruit cages you can buy that just slot together and myself and Mr Thrift are not very good at D-I-Y, so a few years ago I came up with the idea of using canes, bottles and netting and it had worked brilliantly over the years. 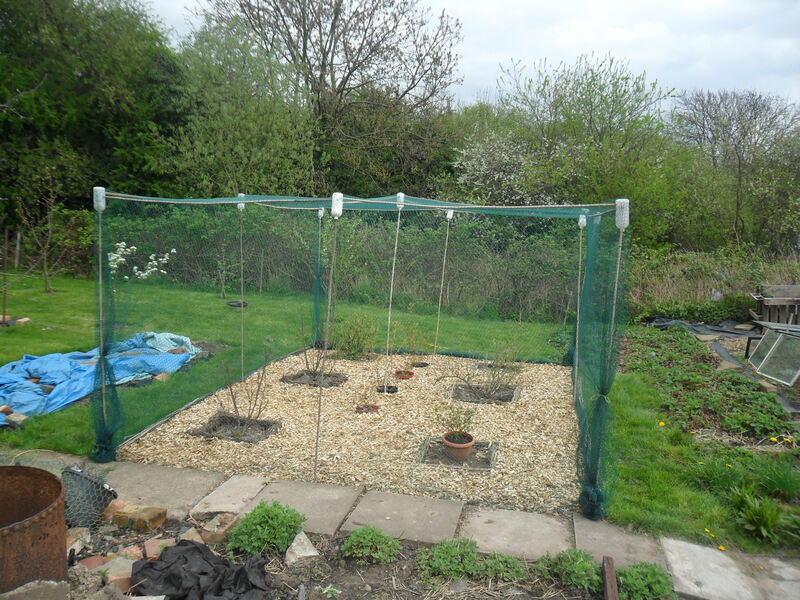 Fruit netting should really be taken down over the winter so the birds can eat the grubs that pupae under the fruit bushes, so my cage works great as it’s only needed for a few months in the year. 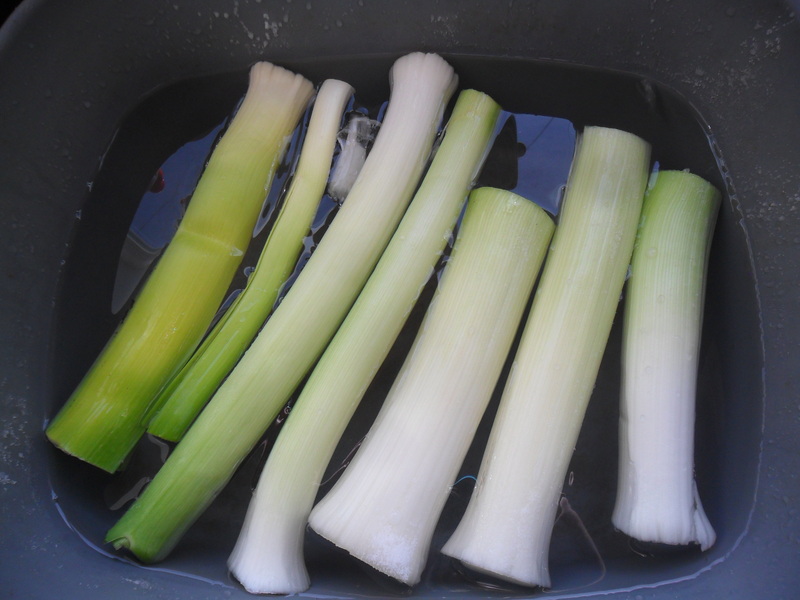 I also dug up some of my remaining leeks this week and made the most enormous pot of leek and potato soup, also using my last few homegrown potatoes from last year. 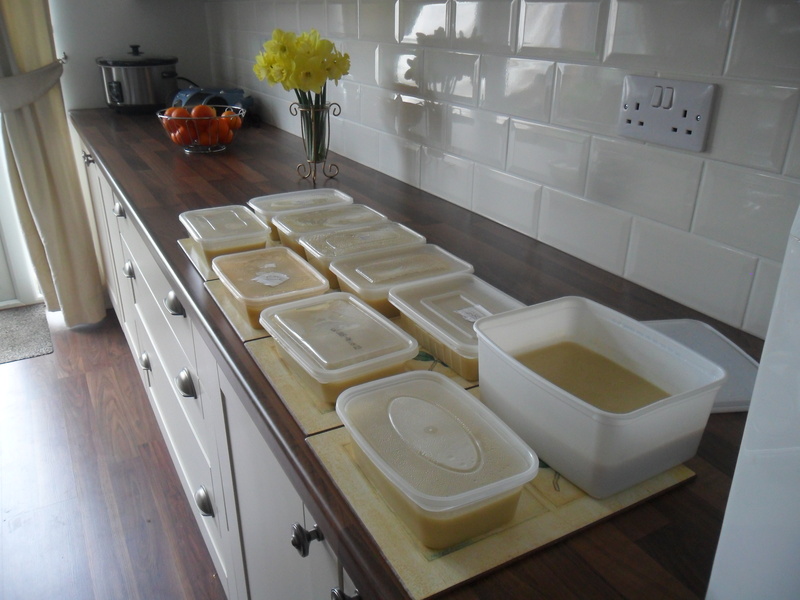 I managed to get nine portions of soup to freeze and I also sent some of it down to my In-laws for lunch. I always feel good when I have made meals out of homegrown vegetables. I find it so satifying. Finally, I decided to change the signs that show my plot number, as the old ones were really scruffy. 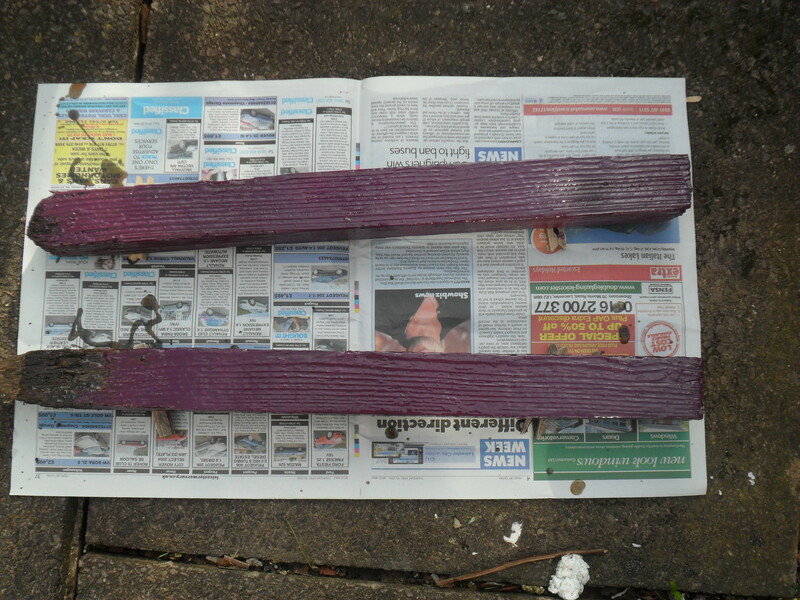 I used some old wood and the posts from the old signs and gave them a lick of paint. I then used my daughter acrylic paints for the colours. I still have two more posts to paint yet. 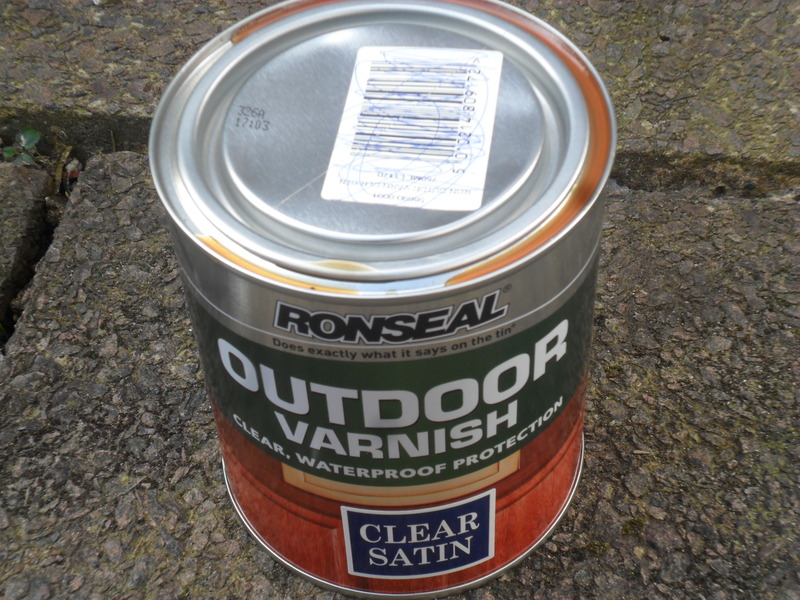 Wilkinsons were selling some of their paints and varnishes off cheap and I managed to get a small tin of varnish for just 50p (which I was really quite proud of). So I have now given my new signs their first coat of varnish. 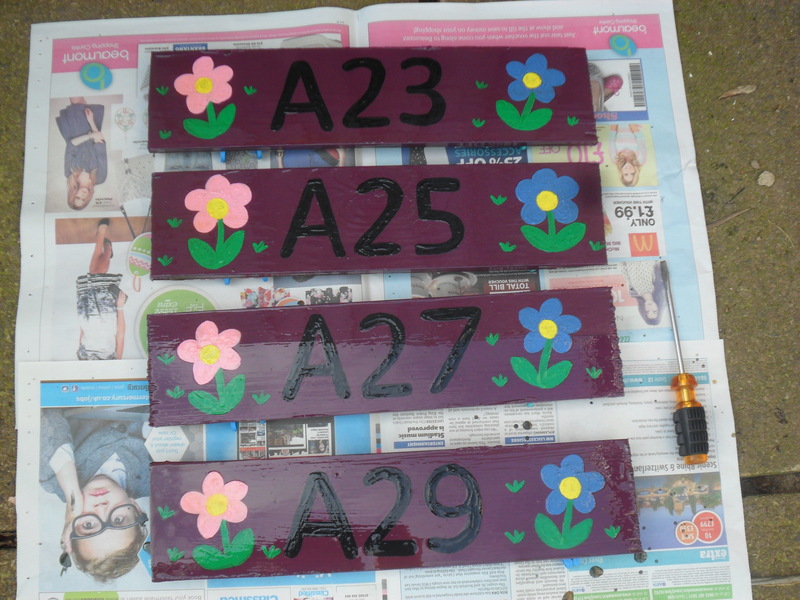 I’m not really an artist as you can see, but I’m quite pleased with them so far (even though they are a bit ‘girlie’)…. Anyway, it’s time for me to go now. I am going to take a couple of weeks off writing, to spend time during the Easter school holidays with my daughters. So I will be back on Monday 28th April. I will be around to read and answer your comments so please them coming, as it’s lovely to hear from you. Thank you for reading my blog today and have a good easter. 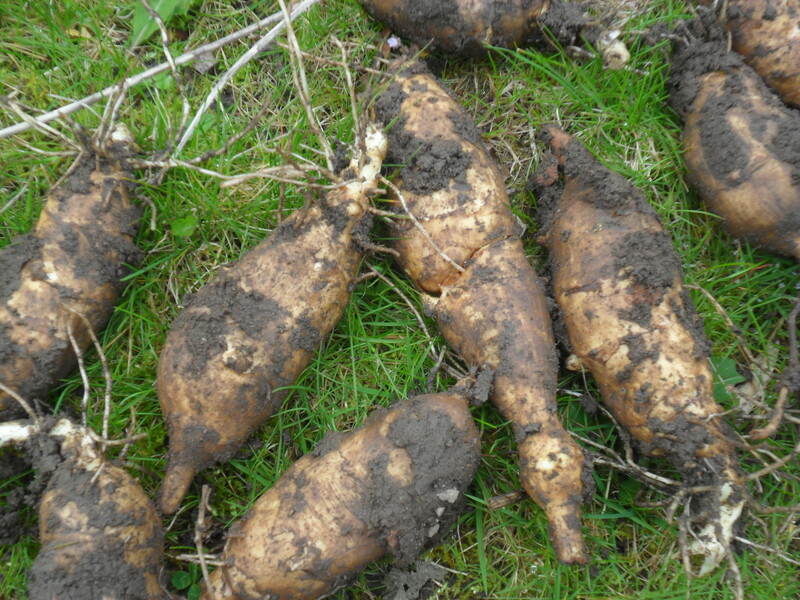 This weekend I dug up my remaining parsnips at my allotment, as it is time to prepare the soil ready for my next crop. The parsnips were a variety called ‘Gladiator’. I must say I have been really pleased with this parsnip crop, as hardly any of them ‘forked’ in the ground and some of them were really quite large. One of them in the above photo was sixteen inches long! 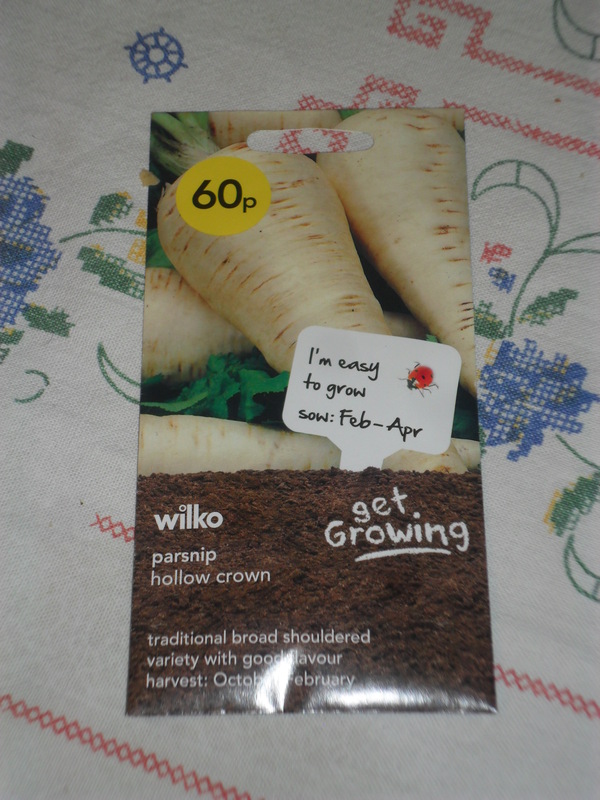 This coming week I will be sowing more parsnip seeds ready for next winter. 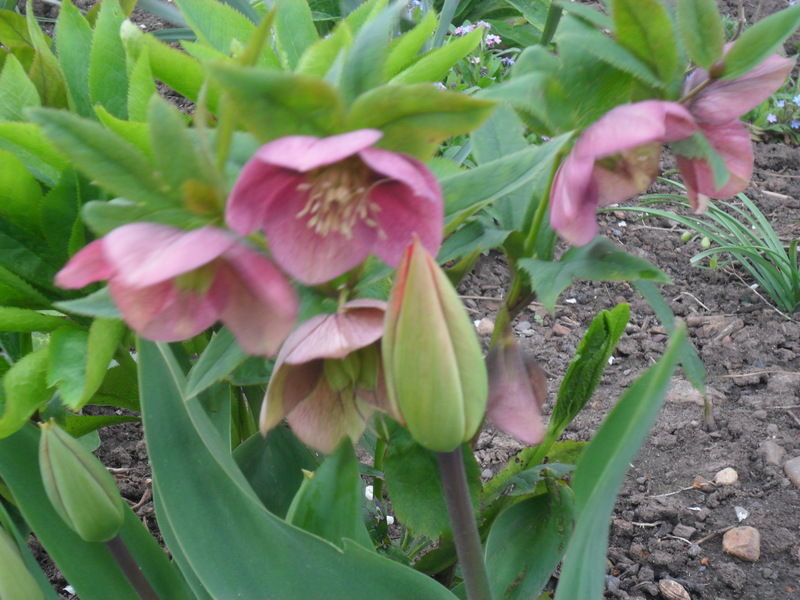 I will be sowing a variety called ‘Hollow crown’, which I have also grown before. The reason for my choice of variety is….they were cheap. 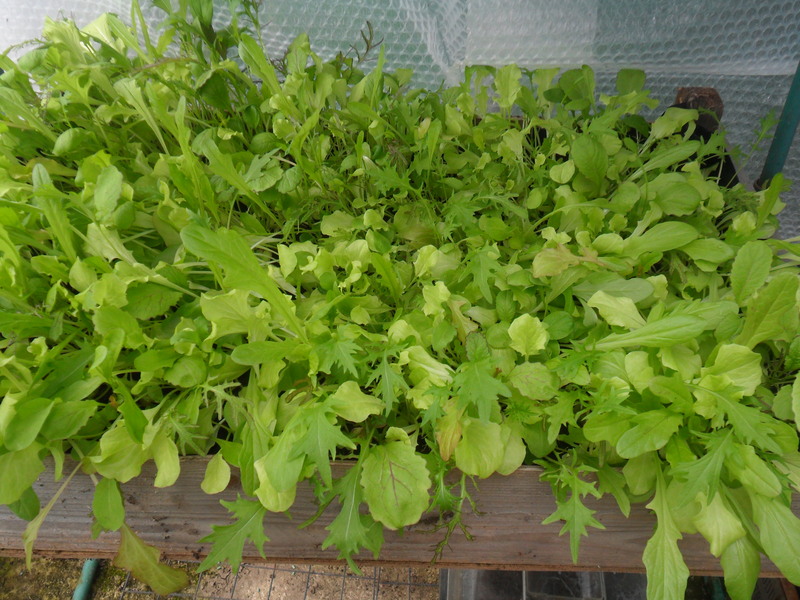 I have tried various different methods of sowing parsnip seed, each with only limited success…. 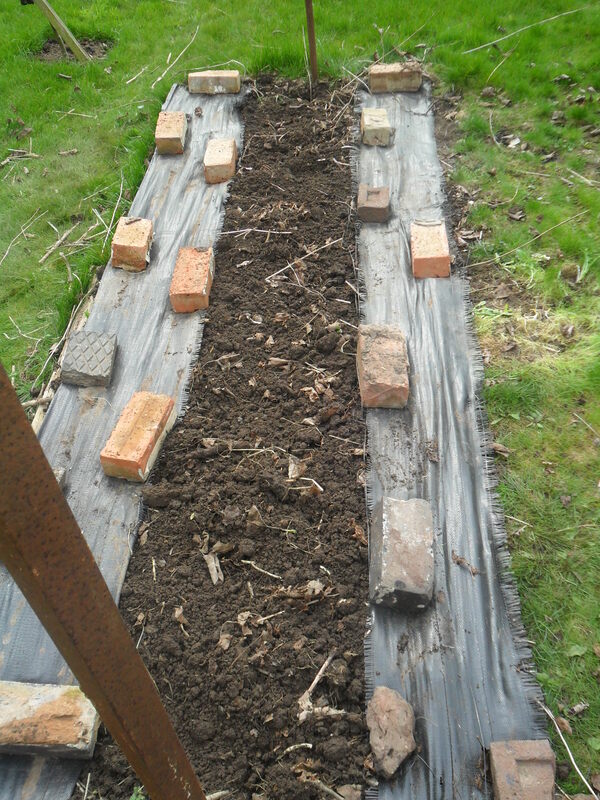 I tried filling trenches with compost and then sowing the seed. 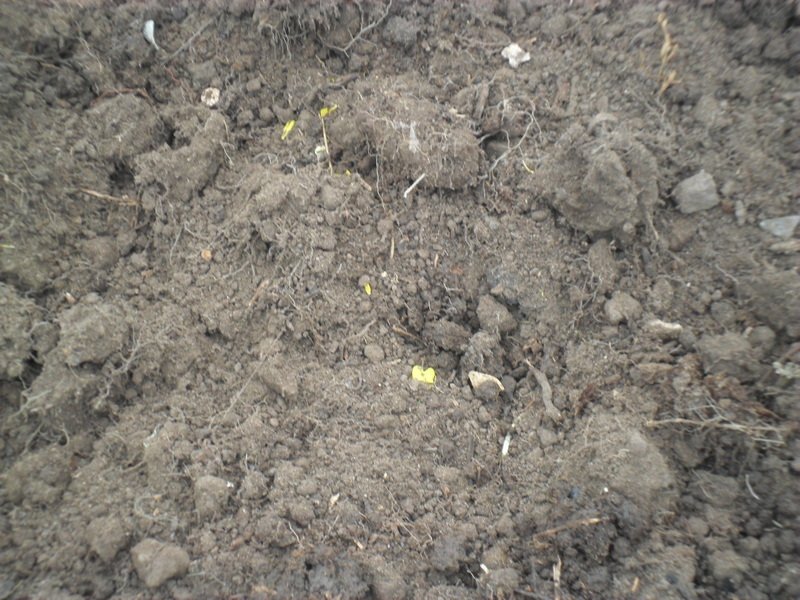 I tried filling holes in the ground with compost and dropping seeds into them. I have sown the parsnip seeds on wet tissue paper and the minute they germinated I used tweezers to carefully place the seeds where they were to grow outside. 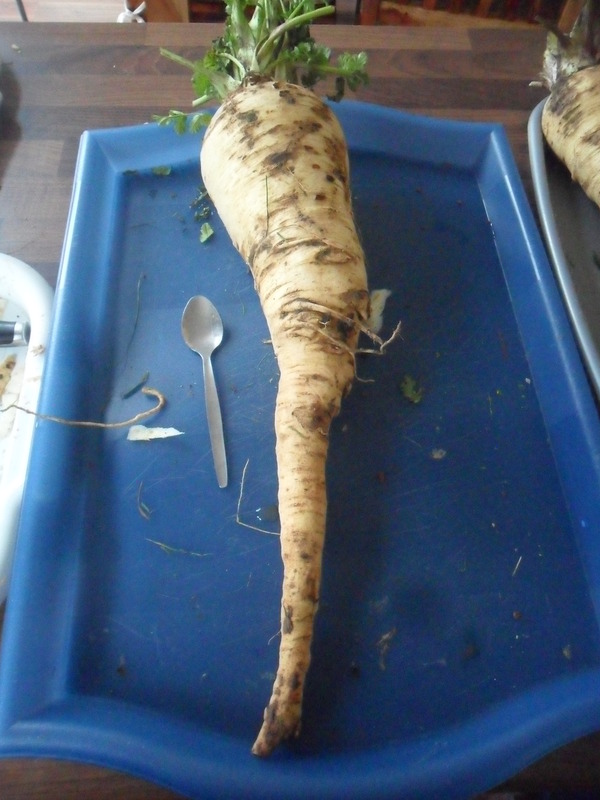 The few parsnips that actually germinated would always ‘fork’…. 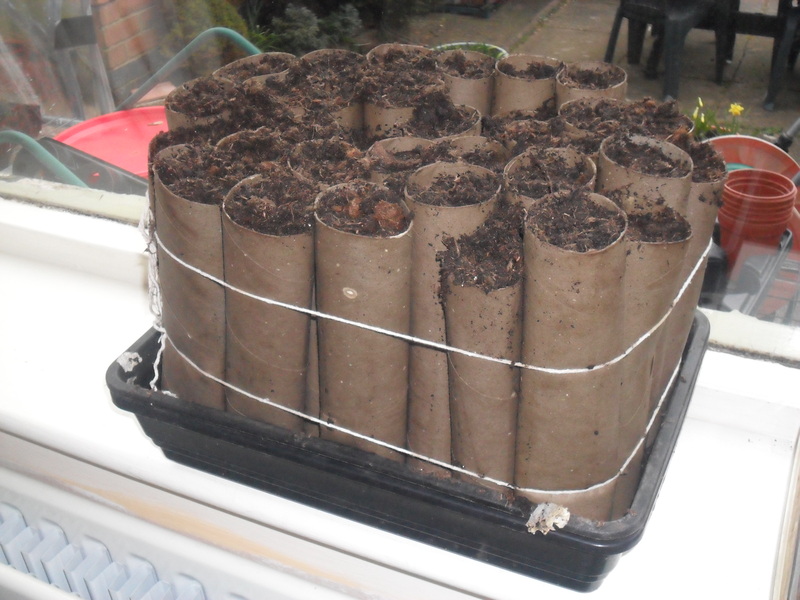 until a few years ago I started to sow my seeds into kitchen roll tubes…. 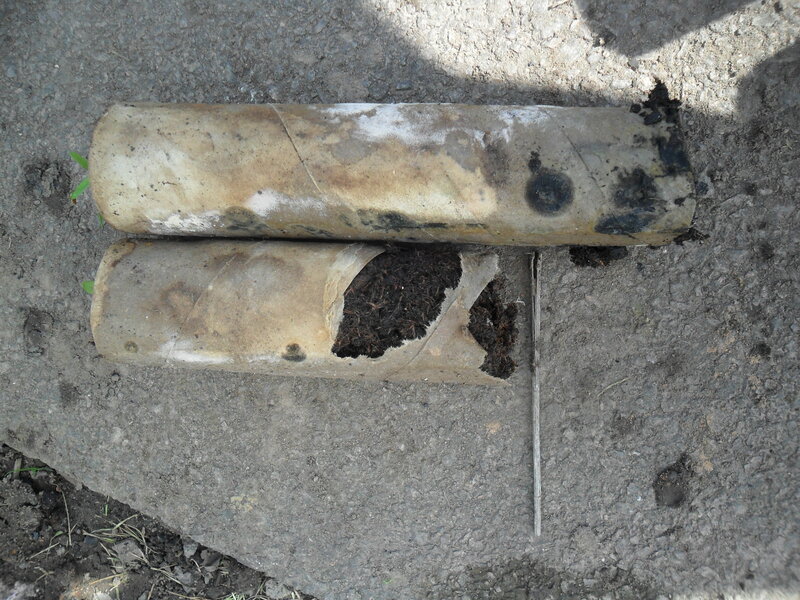 The photograph above shows the kitchen roll tubes that I used last year to grow the parsnips that I have just dug up. 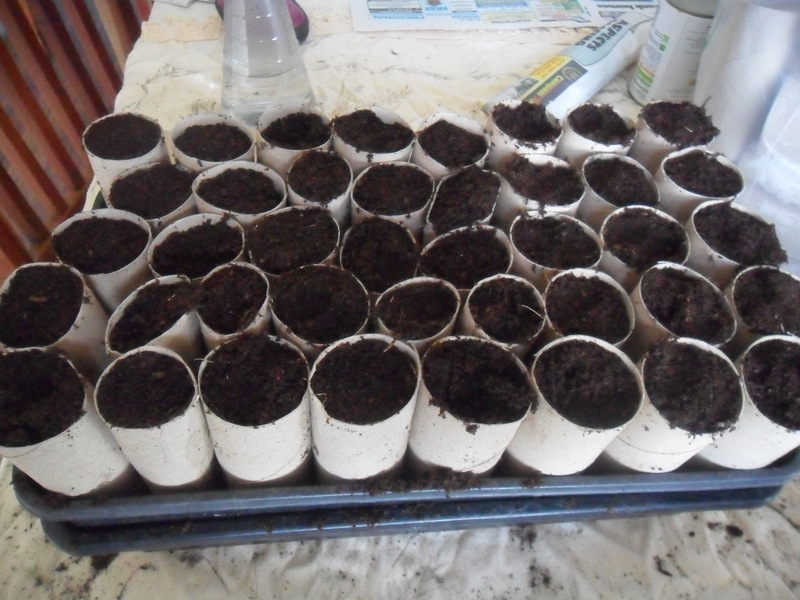 I filled the kitchen roll tubes with compost and sowed three seeds in each. I then tied some string around the tubes (just to stop them from falling over) and then kept the tubes on my windowsill in the warm. 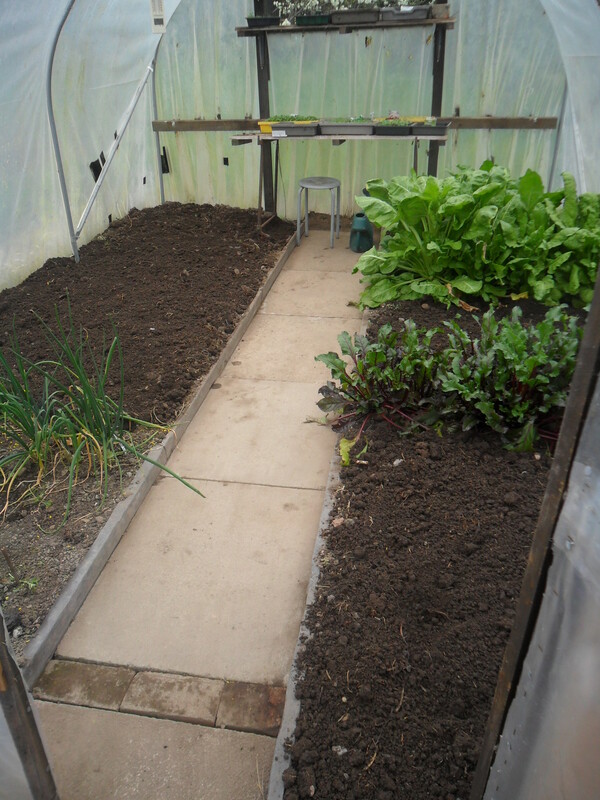 As soon as the seeds germinated, I moved them outside into my coldframe and then a week later I planted the whole tube into the ground before the parsnip root showed at the bottom of the tube. This way I now have straight parsnips nearly every time. 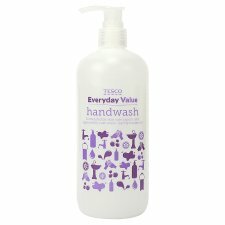 I have been asked in the past if this works with toilet rolls but it doesn’t. 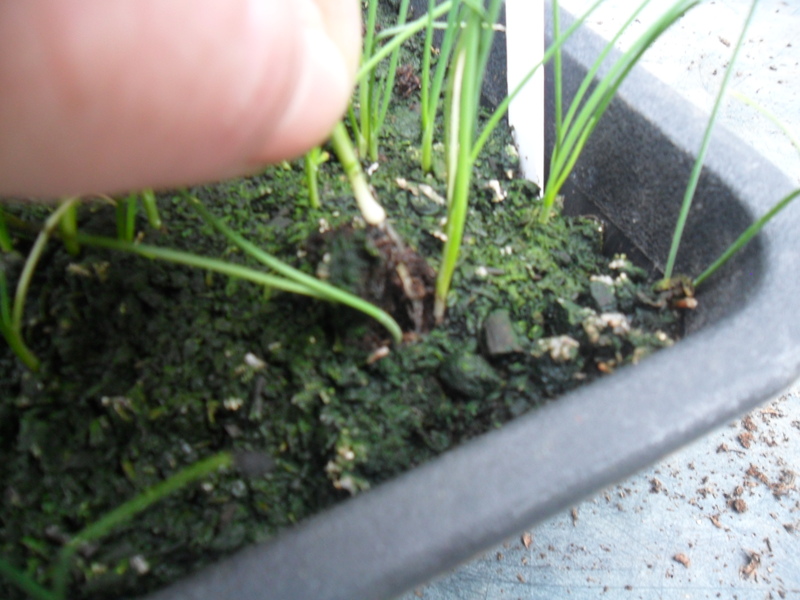 The parsnip root is quite long by the time you actually see the little seed leaves emerge above the compost and unfortunately if the bottom of parsnip root touches anything hard (e.g. 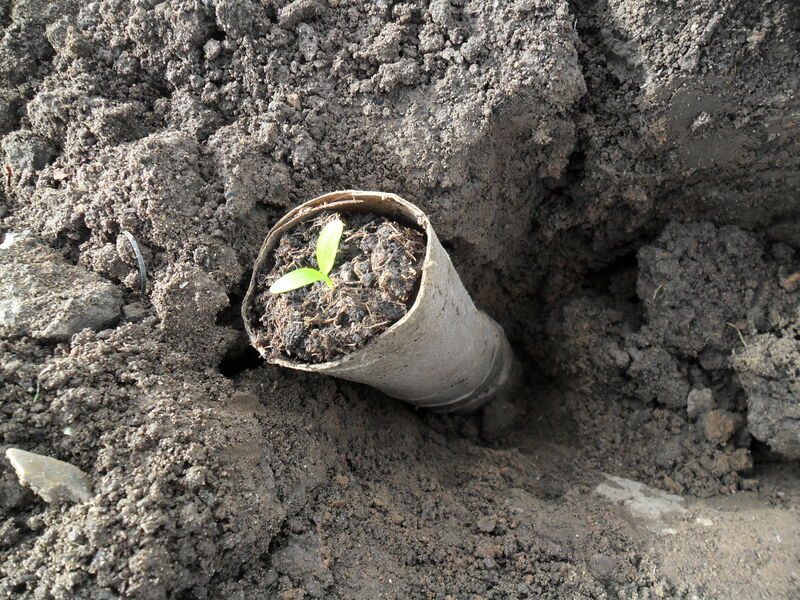 the seed tray at the bottom of the cardboard tube), it will cause the root to ‘fork’, so you won’t have straight roots. However, as the kitchen roll is longer, the tap root has a longer distance to grow before it hits the bottom. 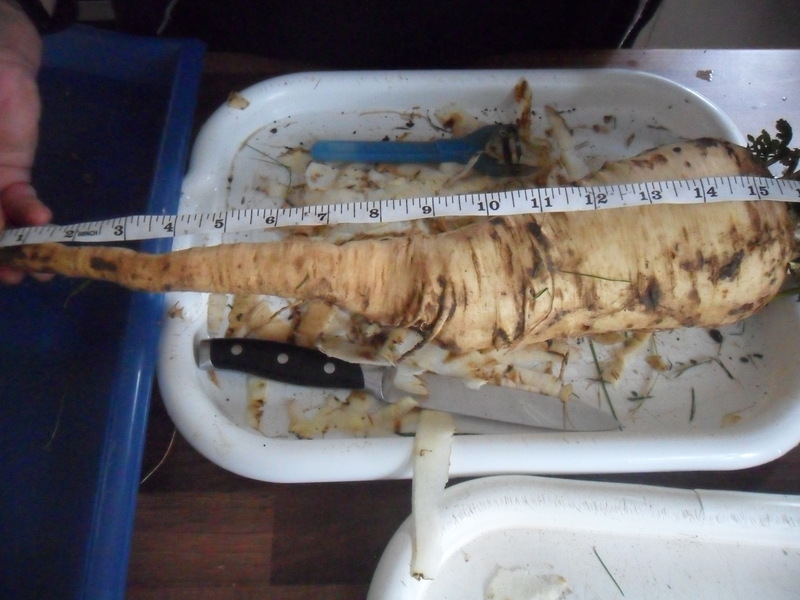 The root is 10cm long already and an average toilet roll is approximately 11cm, so if you use toilet rolls, very quickly the root will hit the bottom of the seed tray which will cause it to ‘fork’, so your parsnip will not be straight. 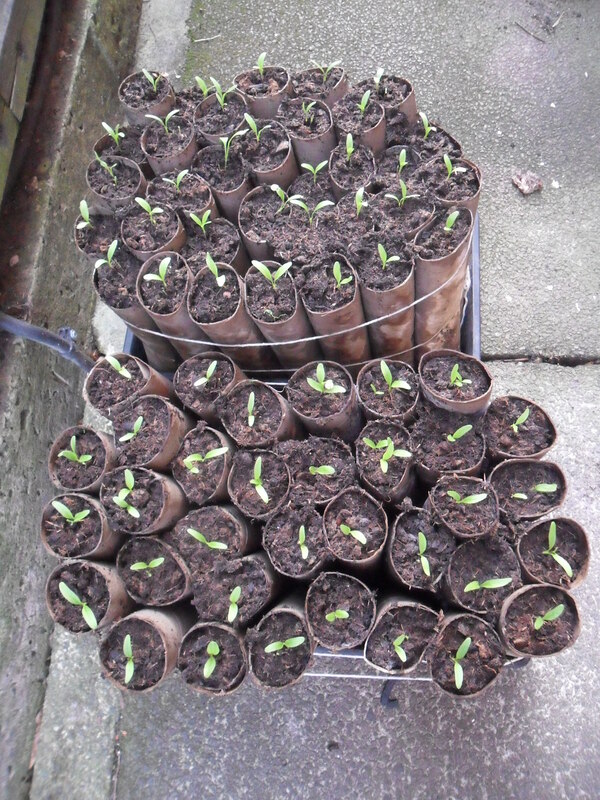 Last year I planted my seedlings out, just under three weeks after sowing the seeds. 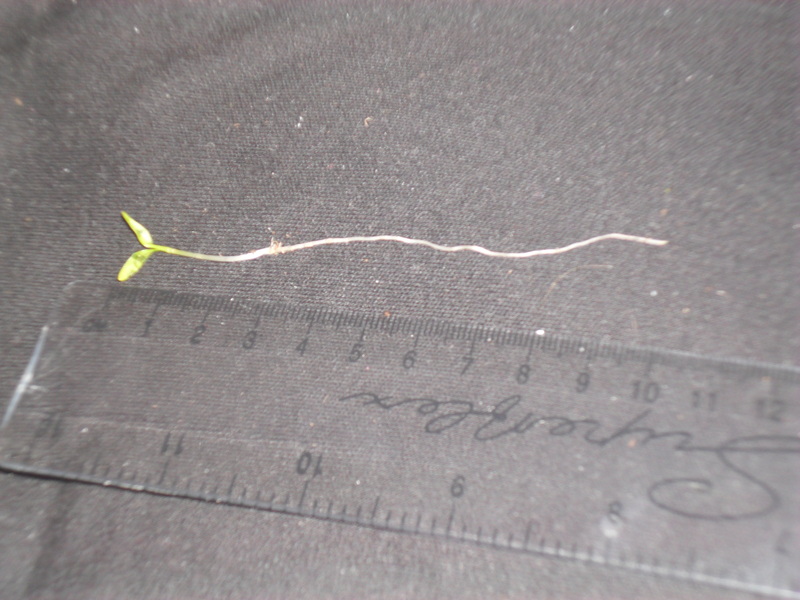 You can see from the photograph below, how long the roots were when I planted them out. The shorter tube (which I didn’t plant as I wanted to use it as a comparison), shows where the root reaches down to in the cardboard tube and the longer tube is there to show the length of an average kitchen roll tube, so you can compare the two together. So you can see there is still a small amount of room for the root to grow down. I must admit it is hard work planting the tubes out as you need deep holes, but the compost in the tubes helps to stop the parsnip from ‘forking’ as the roots won’t hit any stones or lumps in the soil while they grow. 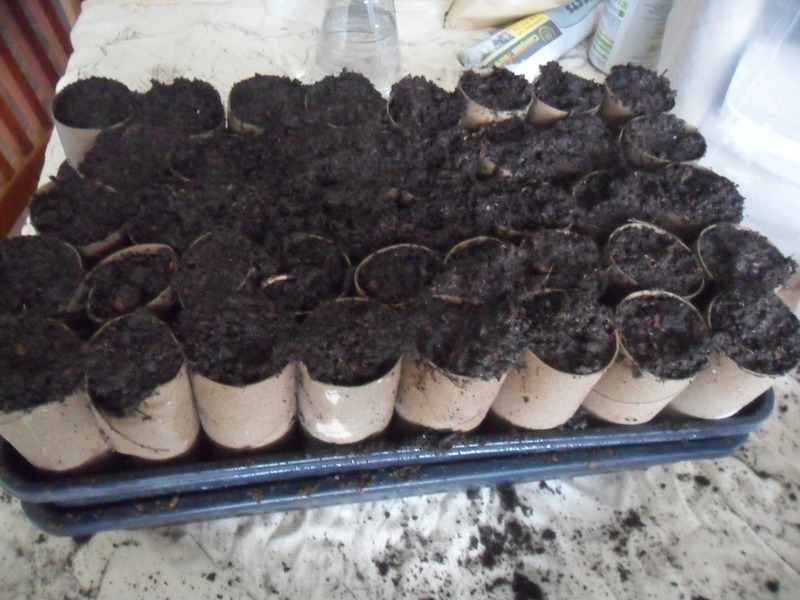 When I plant them I make sure that none of the cardboard tube is above the surface, or this will act like a wick and dry the compost out. I think the hard work is worth it when you harvest lovely straight parsnips. 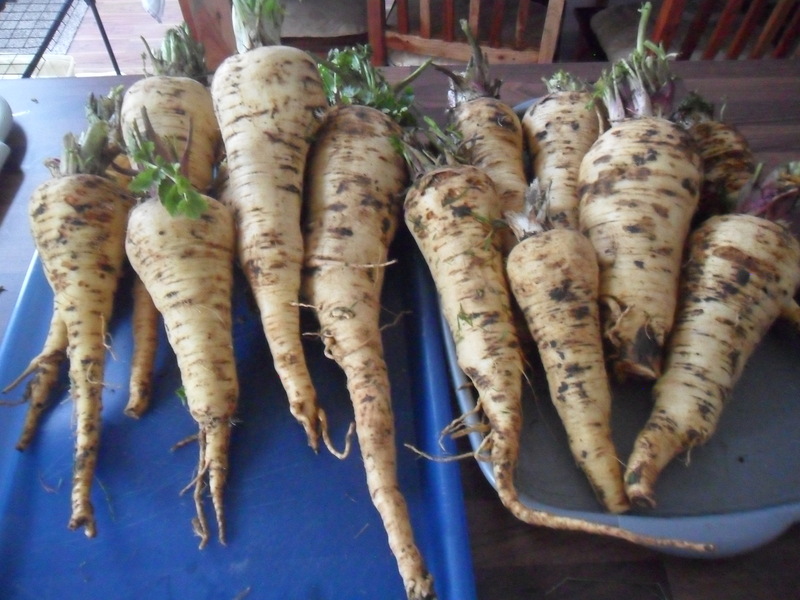 What will I do with so many parsnips? 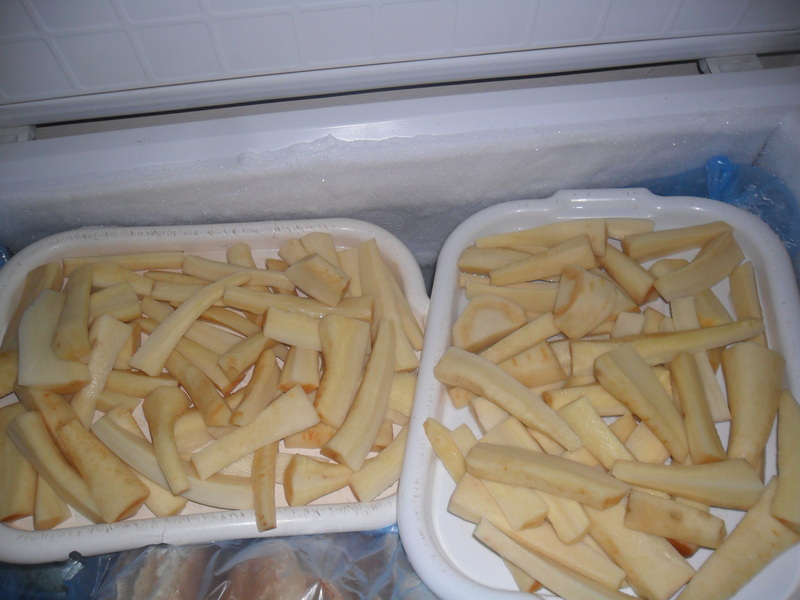 Some of the parsnips I have already chopped up and frozen on trays (unblanched) and then I bagged them up ready for roasting straight from frozen (I don’t bother to defrost them first). By freezing them on trays first, the parsnips don’t stick together in the freezer bags and it’s easy to take out a few at a time and I love the covenience of having them ready to cook from my freezer. 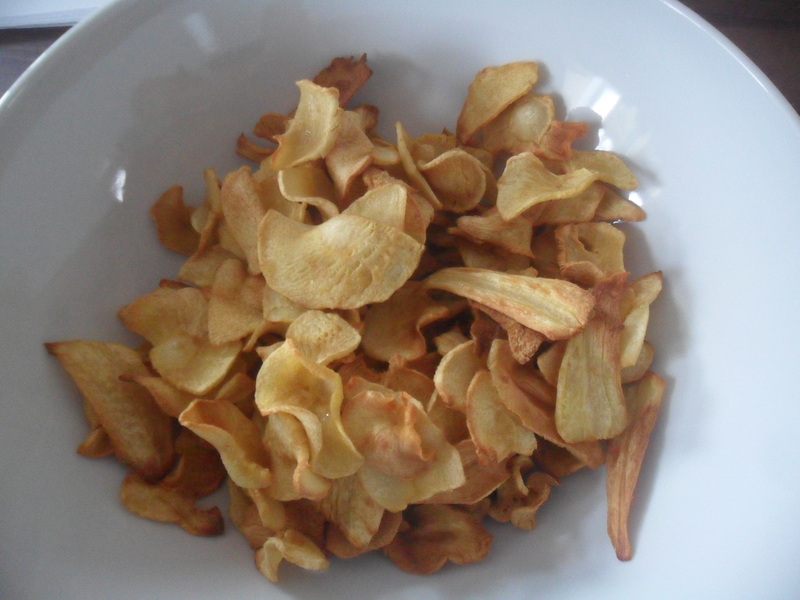 I will definately be using some of the parsnips to make parsnip crisps again, as my family loved them last time I made them. You can find the recipe here. 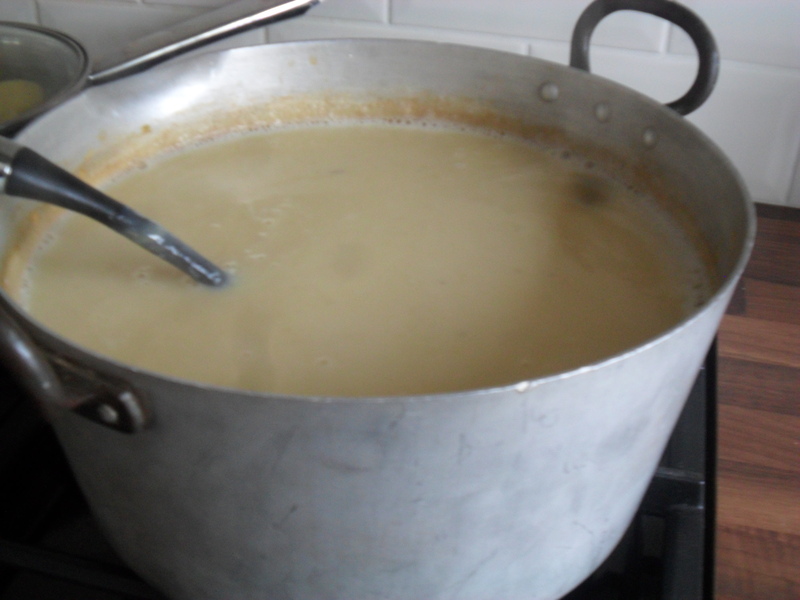 I will definately also be making another big batch of spicy parsnip soup to freeze in portions ready to reheat and take to my allotment for lunch, as it’s one of my favourite soups. 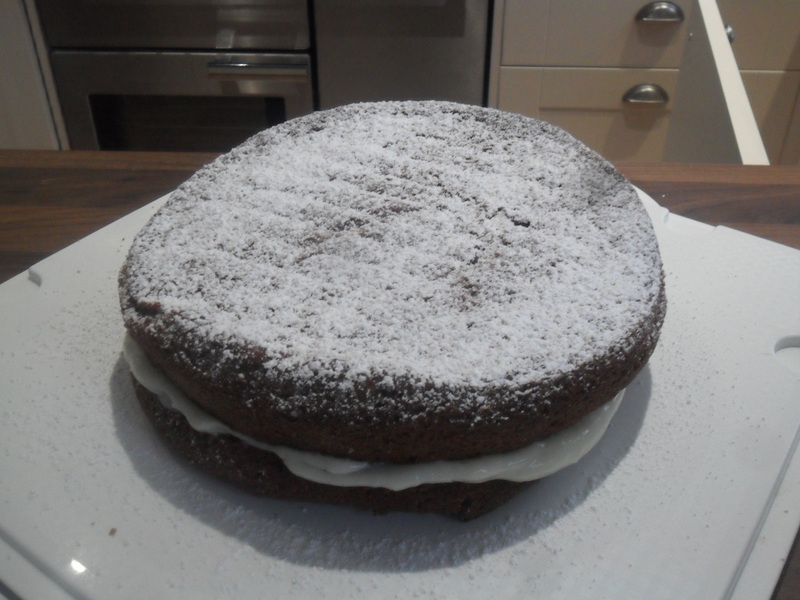 You can find the recipe here too. And if I have any left I may treat myself to a parsnip cake. You can find this recipe here . ….That’s if I get time in between everything else I need to do this week! 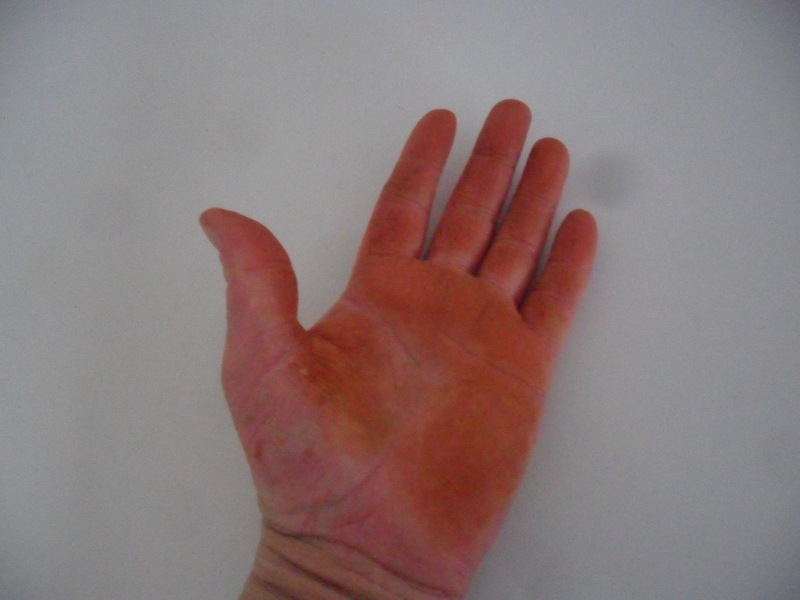 Just one last thing to make you laugh…this is the colour of my hand after I had been peeling and chopping all the parsnips to freeze yesterday and this was after I had washed it! I wonder how long the parsnip stain will last? 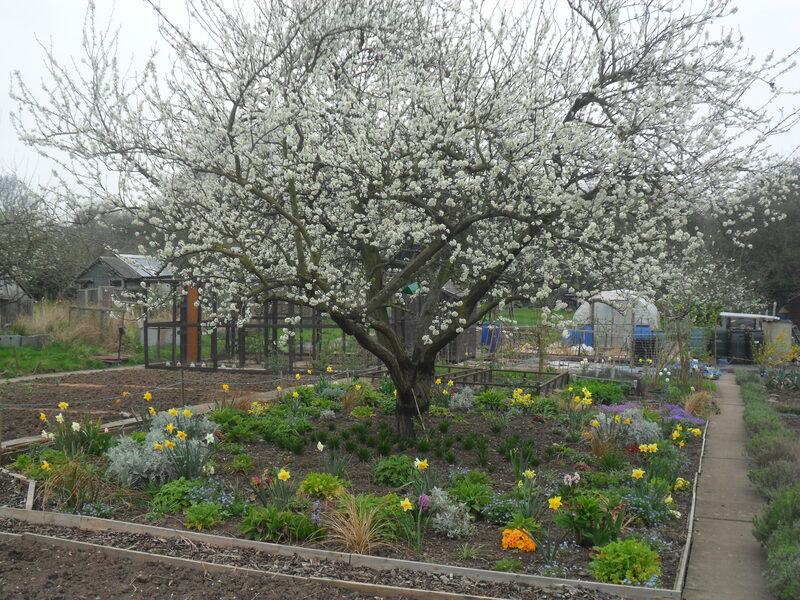 I’ve had another busy week at the allotment, though it has been a bit murky at times due to the cloud of pollution over the UK. I thank my lucky stars that I don’t have asthma, as I know I wouldn’t have been able to work outside if I had. Many asthma sufferers have been struggling this week with high level of pollution in the air, which is apparently due to “a mix of local and European emissions and dust from the Sahara”. By Thursday this week, I had begun to miss the sunshine and was hoping that things will get back to normal very soon. 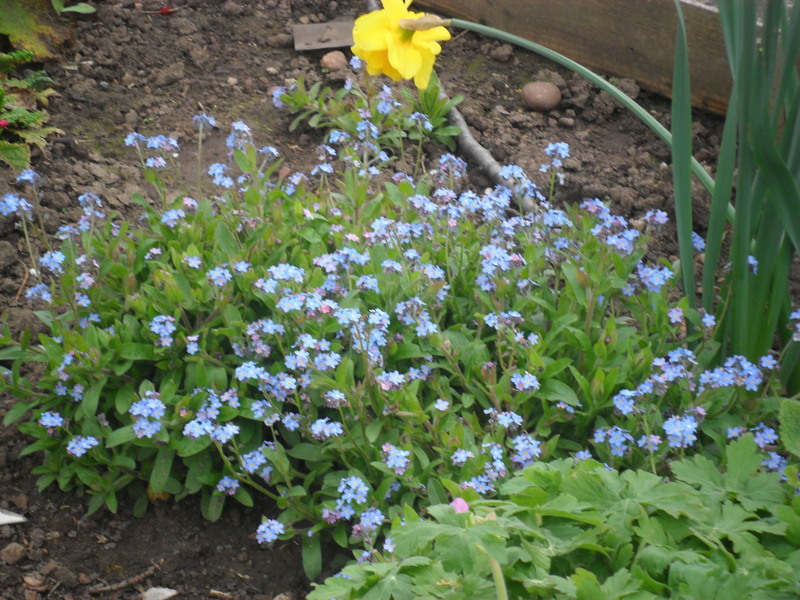 The last photo shows my ‘Forget-me-nots’ which I planted in the hope that they will self seed all over my woodland area, as I dedicated this area to my good friend who passed away last year. 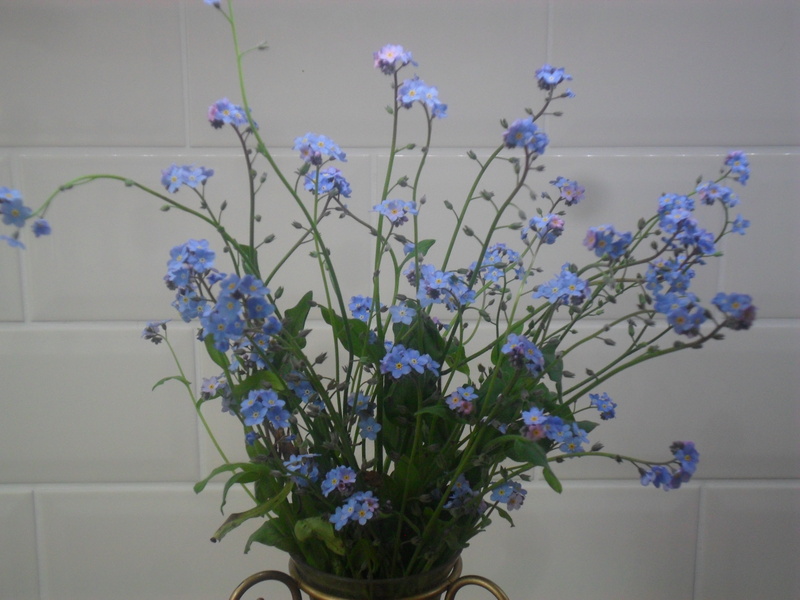 I don’t want to forget her, which is why I planted the ‘Forget-me-nots’. When I first took over this plot, the area was full of couch grass. 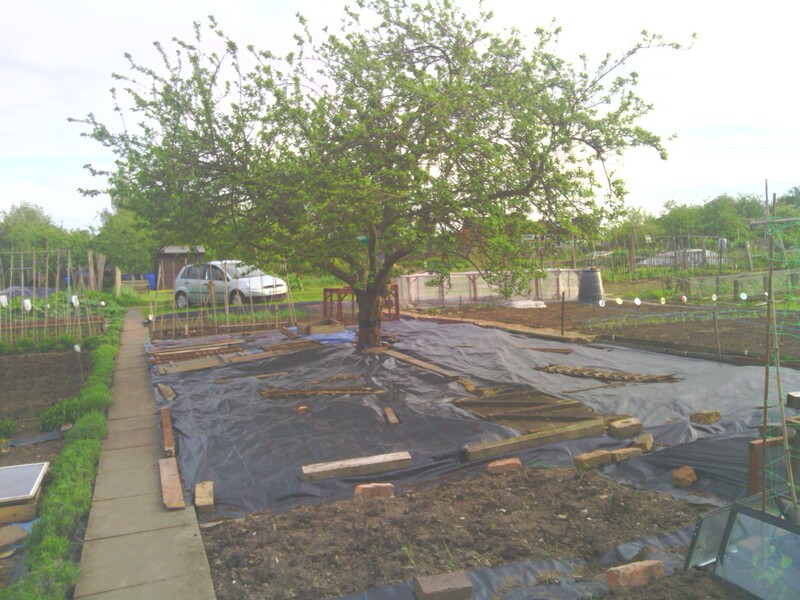 The previous plot holder (my dear friend Eric), told me that vegetables do not grow well around the tree, as the tree roots take all the moisture. 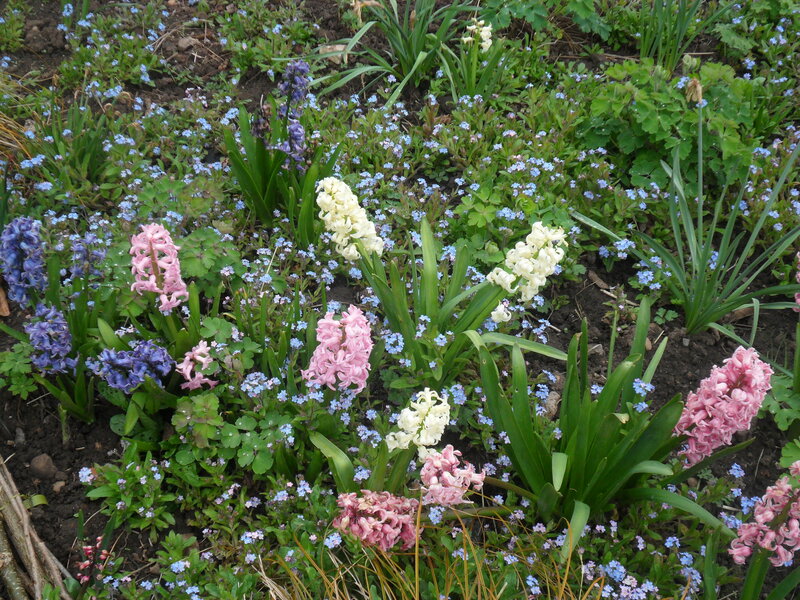 This is the reason why I decided to make it into a sort of Spring garden / woodland area. 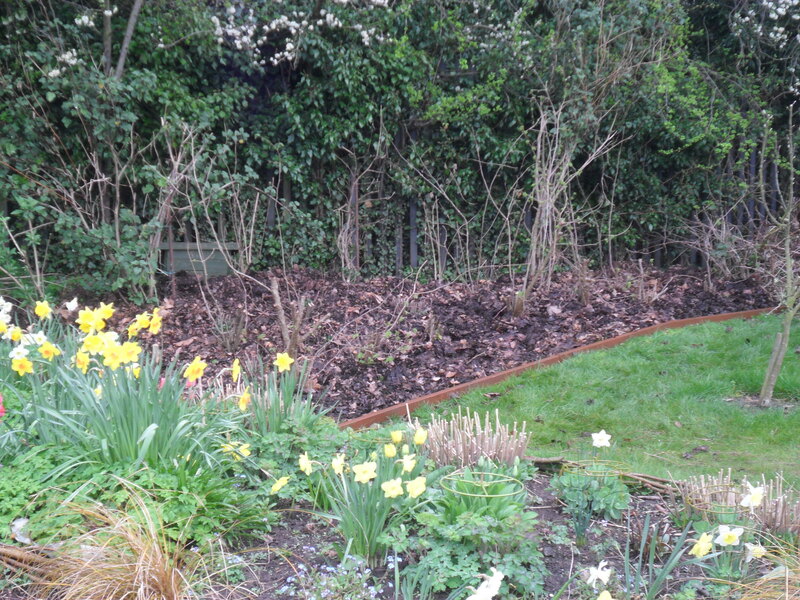 I then removed the weed suppressant, which had killed all the weeds and started planting Spring bulbs. 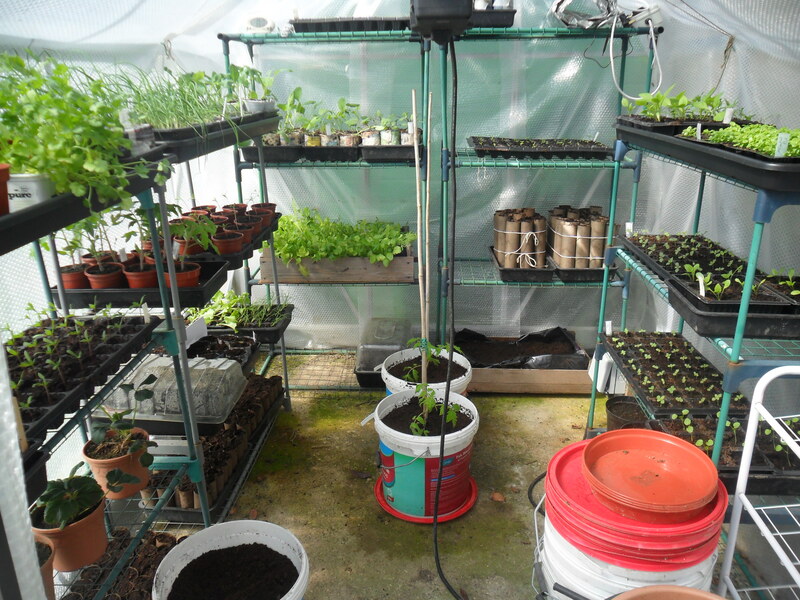 From then on I have been dividing and transplanting any plants I can find, to fill the area. 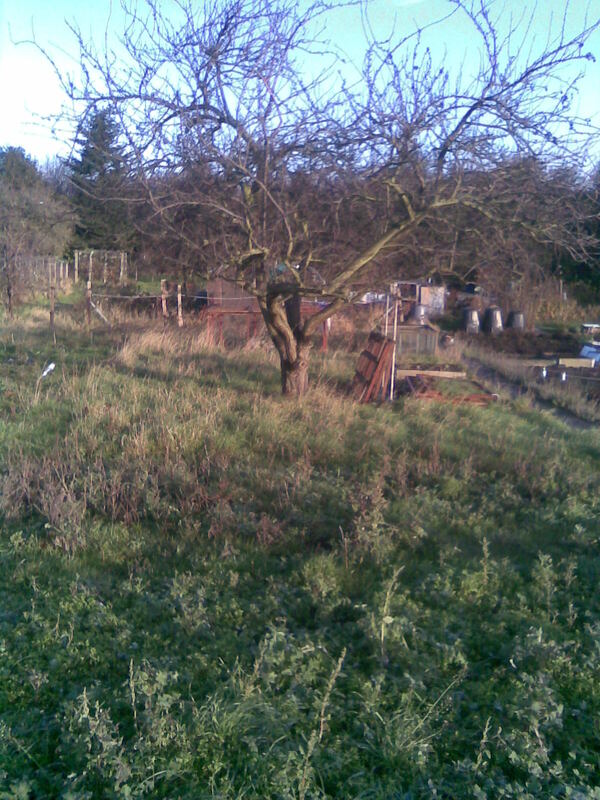 Last summer I also gave the plum tree it’s first big prune, though it will take a few years to get the tree back to how it should be. 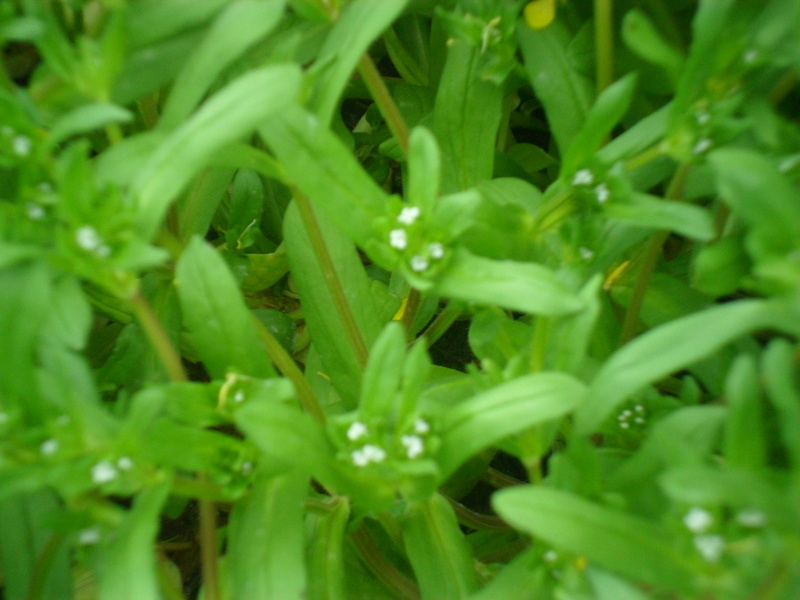 If you look at the edges of the leaves you will see little notches. I have been asked on various occaisions what causes these notches. This is the work of the ‘Pea and Bean weevil’. The adults are beetles that are approximately 4-5mm long, but they are very hard to find as they drop to the ground when they are disturbed. Their larvea eat the root nodules of the plant in the soil. 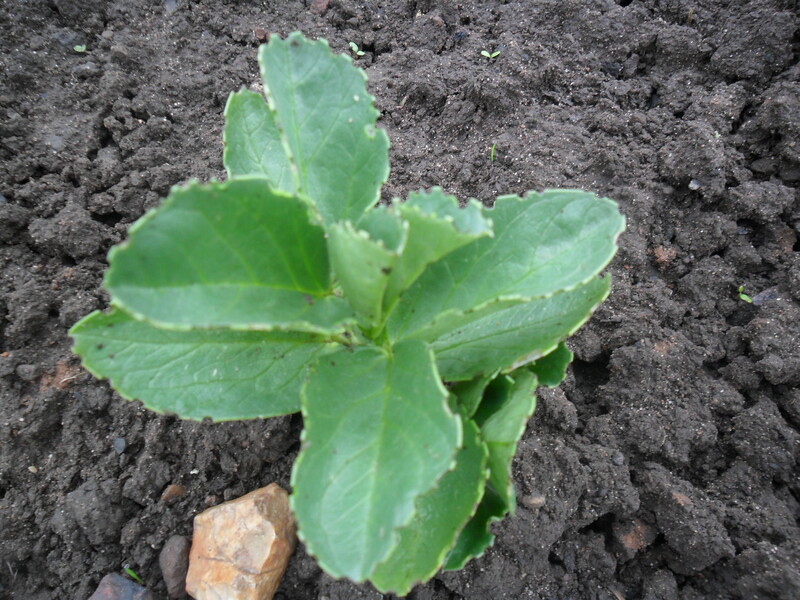 I have never yet lost any plants due to the Pea and bean weevil as most broad beans seem to tolerate the damage, but in theory a bad attack could kill your plants. 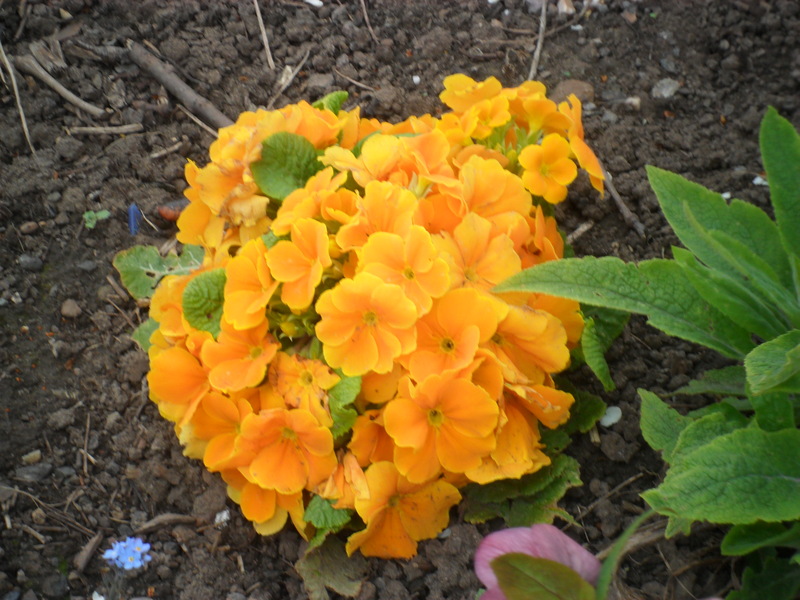 I make sure that my plants are healthy by feeding them in the Spring with a general purpose fertiliser (I use blood, fish and bone) and if the weather is dry then I water them. 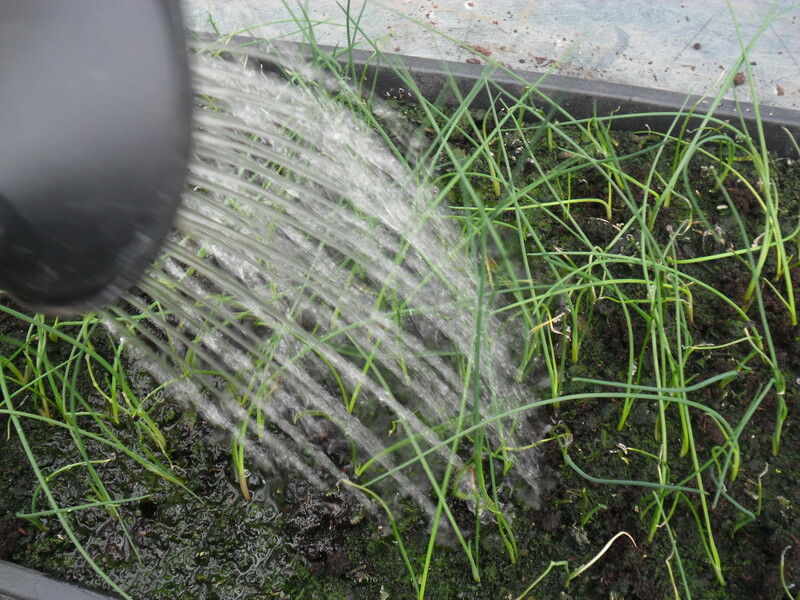 This way I ensure my plants can cope with an attack, as I garden organically and don’t use chemical sprays. At the allotment this week I have been spreading compost around my summer raspberries and my autumn raspberries and around my fairly young fruit trees. 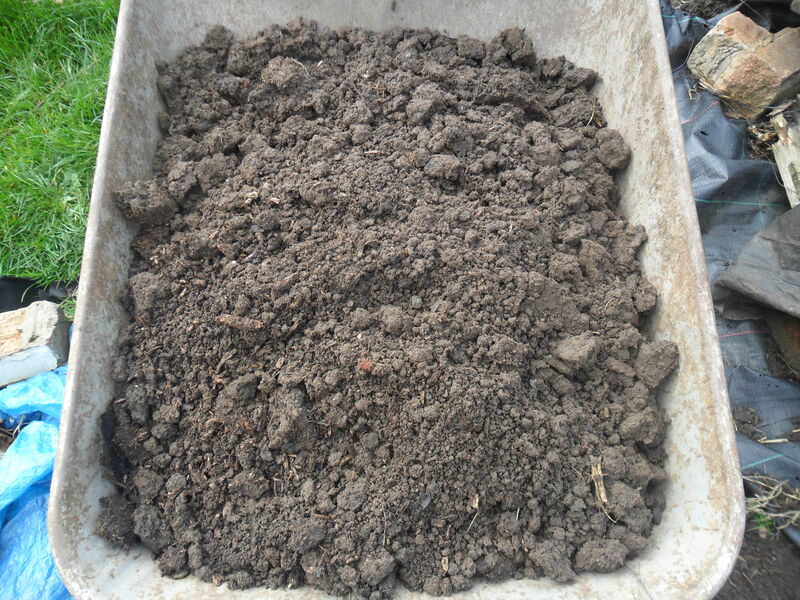 By spreading compost, I am adding nutrients to the soil, conditioning my soil and it also helps to retain water when the weather is dry. Last Friday on Gardeners world, Monty Don talked about his compost heap and once again told us not to put perennial weeds in our compost bins, which is advice that is always given in books and on the TV. I think Monty Don is wonderful. He is so gentle and his passion for gardening really shows through the program (and I adore his dog too). However, on this occaision I have to disagree with you Monty, as I know for a fact that you can compost perennial weeds, as I do it all the time. 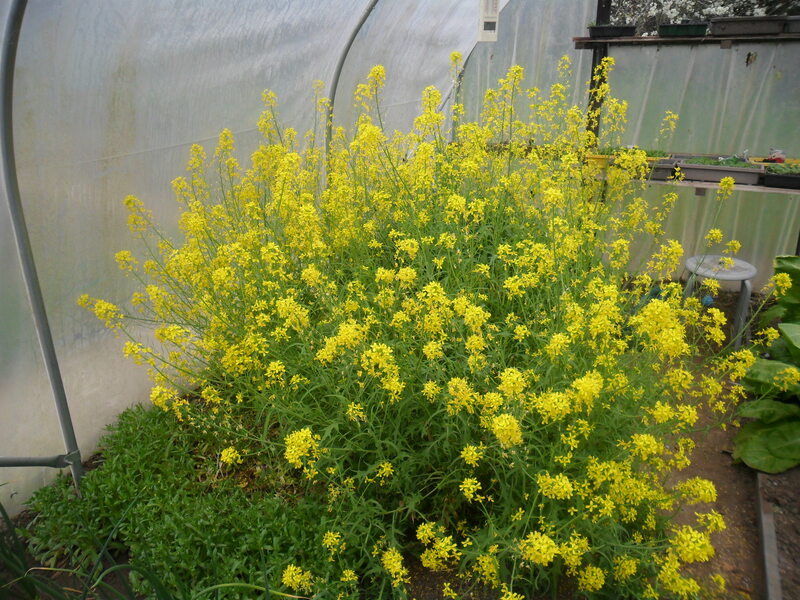 It does take three or four years for perrenial weeds to turn into lovely compost, which is why I have a separate compost area for my perennial weeds, but it is worth the wait. 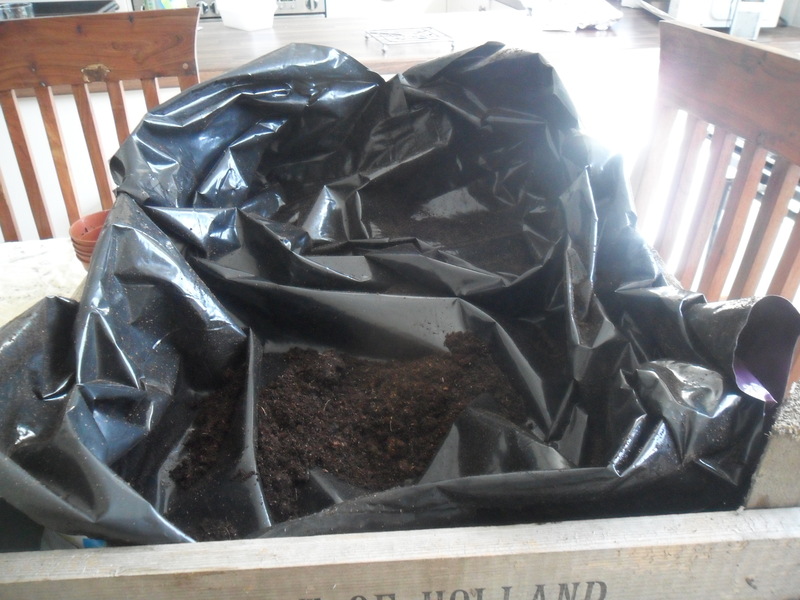 After filling my compost bin, I just cover the top with weed suppressant and wait. If there are any weed seeds in my compost after I have used it, then I just hoe them off, once a week when I am routinely hoeing my plot. 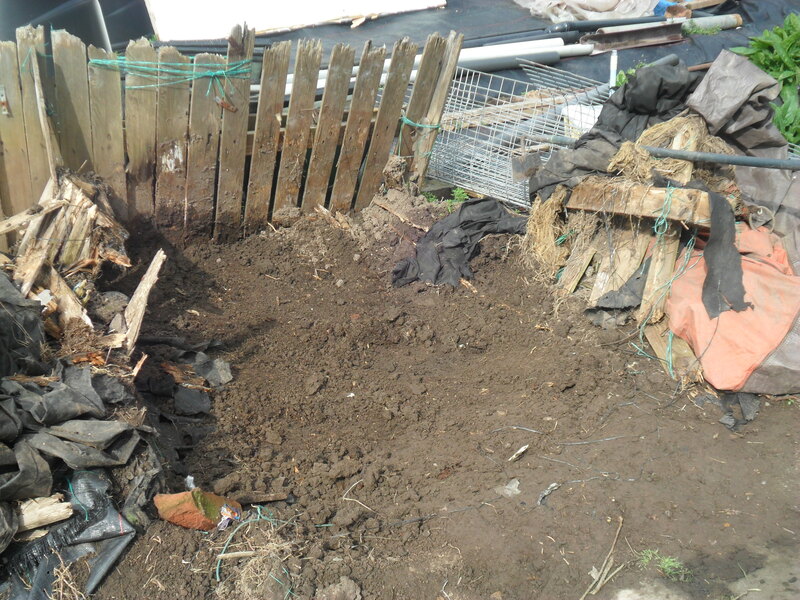 If you want proof about using compost made with perrennial weeds, then take a look at any of the photos on my blog…it really doesn’t spread weeds, provided you hoe every week in the growing season. 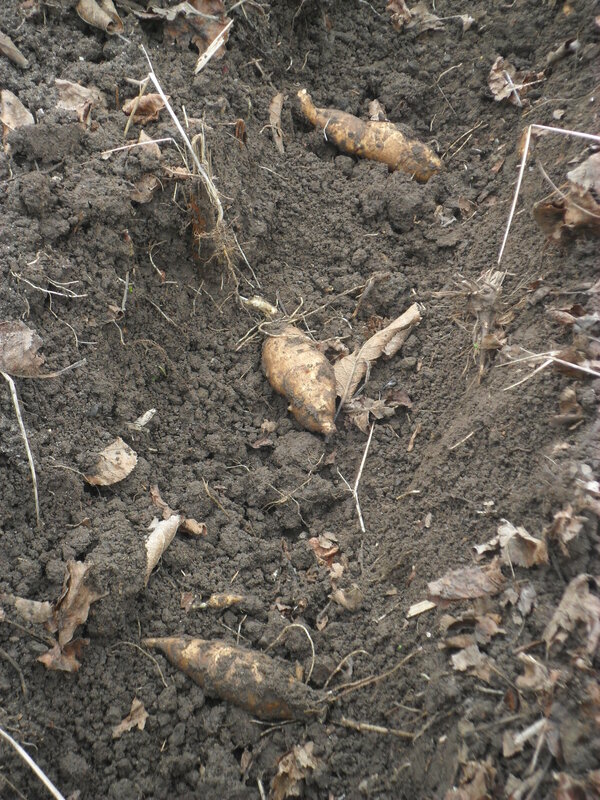 Another job I completed at the allotment this week, was to finally dig up my remaining Jeruselum artichokes. I normally complete this job in February or March, but I am a little bit behind this year. Jerusalem artichokes are one of the easiest vegetables that I know of to grow. 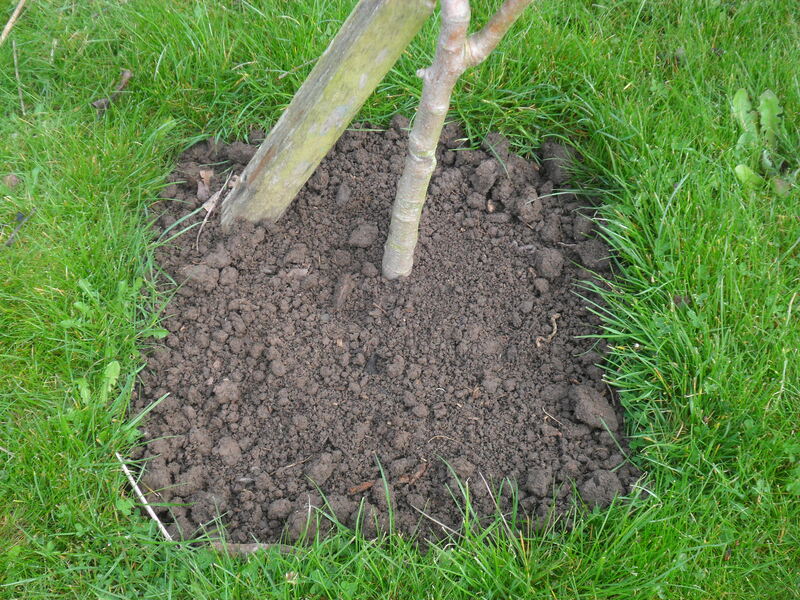 In February or March, I dig up any that remain in the soil and replant the biggest ones, approximately 30cm apart and 30cm deep. Every other year I dig manure or compost into the bed before I replant them and in November, I cut down the old stems so they don’t suffer from the wind dislodging them from the soil. 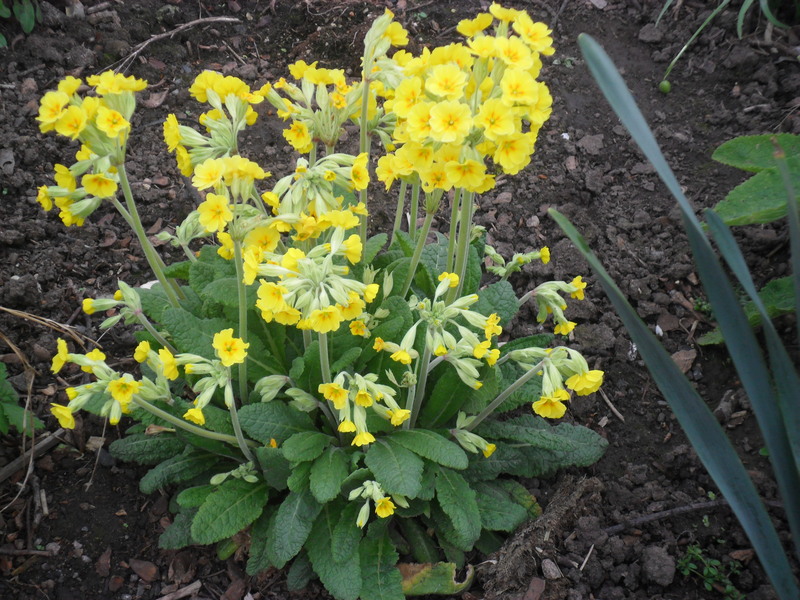 You can dig them up all through the winter when you need them, as they store really well in the ground and they rarely suffer from any pests or diseases. One thing to be noted though, is they are thugs and once you have them you will find it hard to get rid of them. So make sure you plant them in an area away from the rest of your vegetables, or you will regret it. My family love Jerusalem artichokes roasted in olive oil and my daughters eat them like sweets….but be warned, they make you a bit ‘windy’ and I have never dared to make ‘Jerusalem artichoke soup’…I wonder if anyone reading this blog has made it? 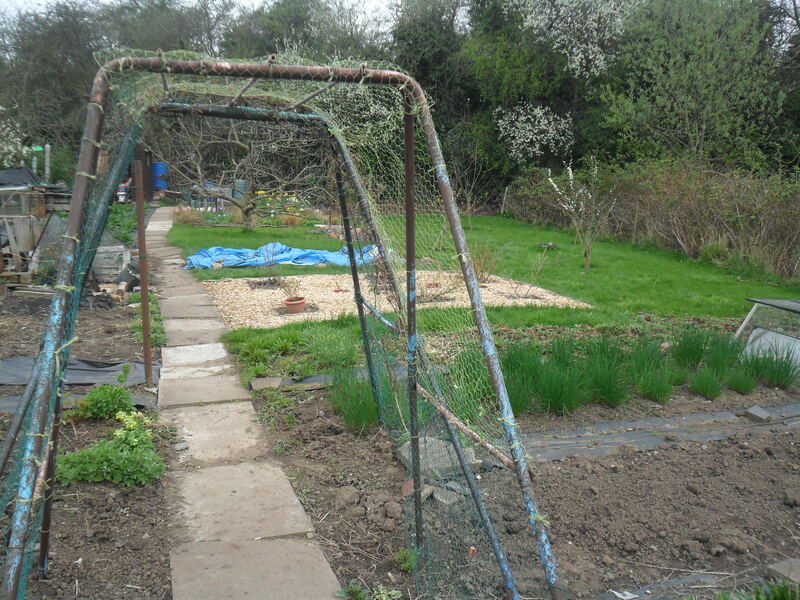 I also finished putting the plastic coated chicken wire over my swing at the allotment this week, so it is now ready for a plant to grow up it. I simply tied the chicken wire on and used three canes to hold the chicken wire up at the top. I can’t wait to see my plants growing over it in a couple of years. 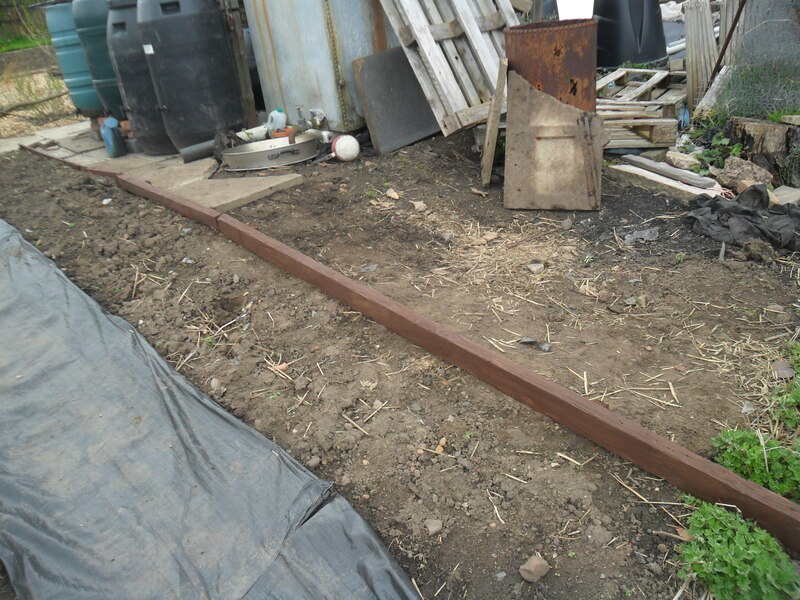 And finally this week I completed a job that Mr Thrift has helped me with over the last few weekends. 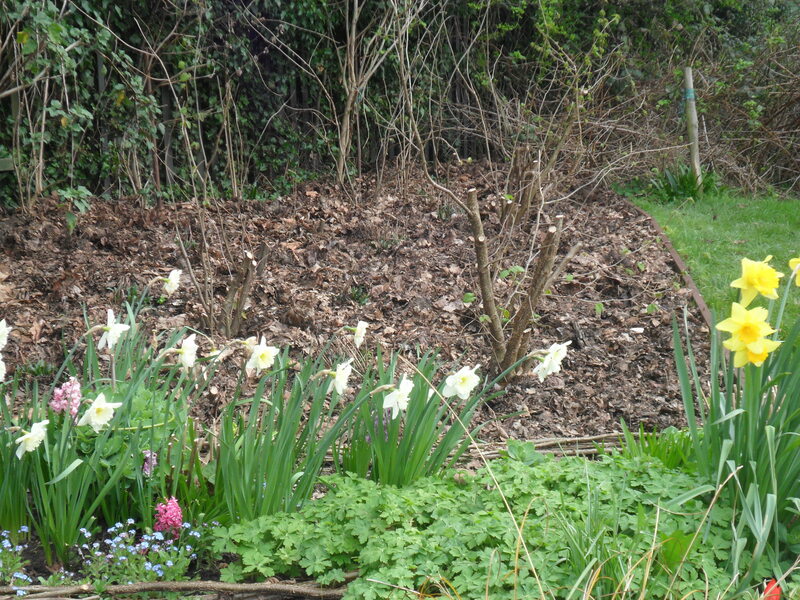 Remember recently I coppiced the Hazel to use, well it left the area kind of bare. I decided to make this a smaller woodland area, so we collected a few bags of leaves that were going spare at our allotment site (the council bring them in the Autumn for people to use) and spread them deep around the trees. This should help to stop the weeds. 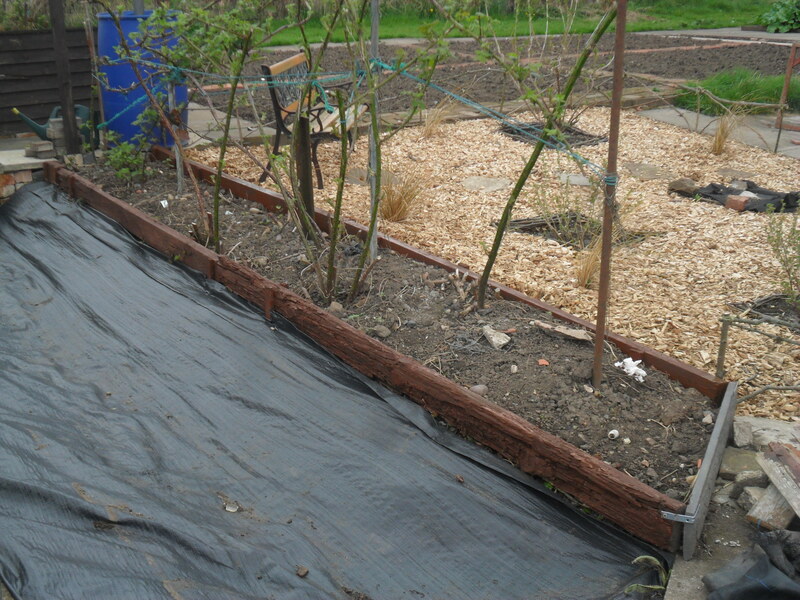 I also used some old wood that I painted with wood stain, to make a barrier so the leaves don’t edge over onto our grass area (and this will make it easier for Mr Thrift to mow the grass in summer). 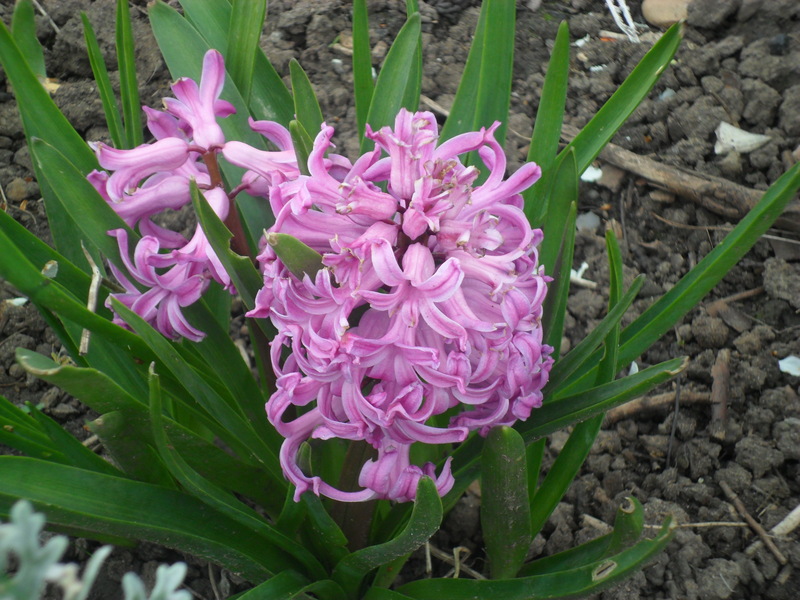 I made a mental note to myself, to plant lots of Spring bulbs in the Autumn. I do hope I remember. Well that’s enough for today (I’m sorry I do pack a lot into my blog, but I do love writing it). Thank you for reading today. I will be back on Monday at my usual time.